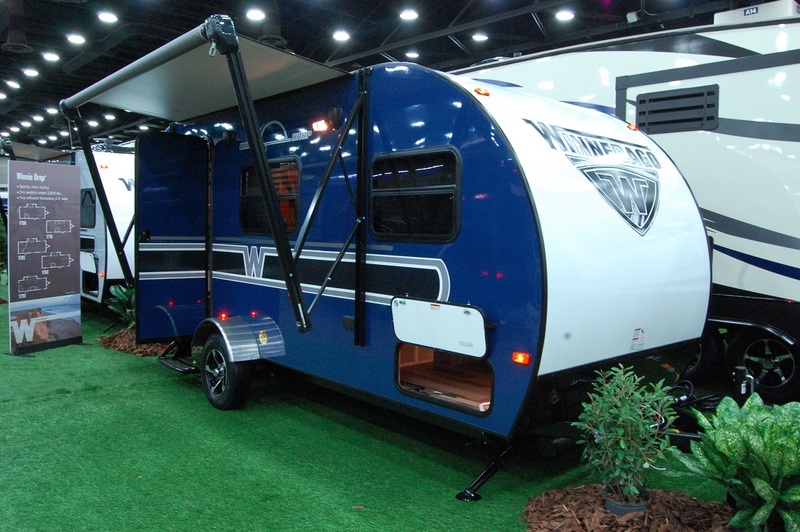 It started a little over a year ago when Forest River filed a lawsuit against Winnebago Industries, citing “trademark and trade dress infringement and unfair competition” in regards to Winnebago’s introduction of the Winnie Drop. 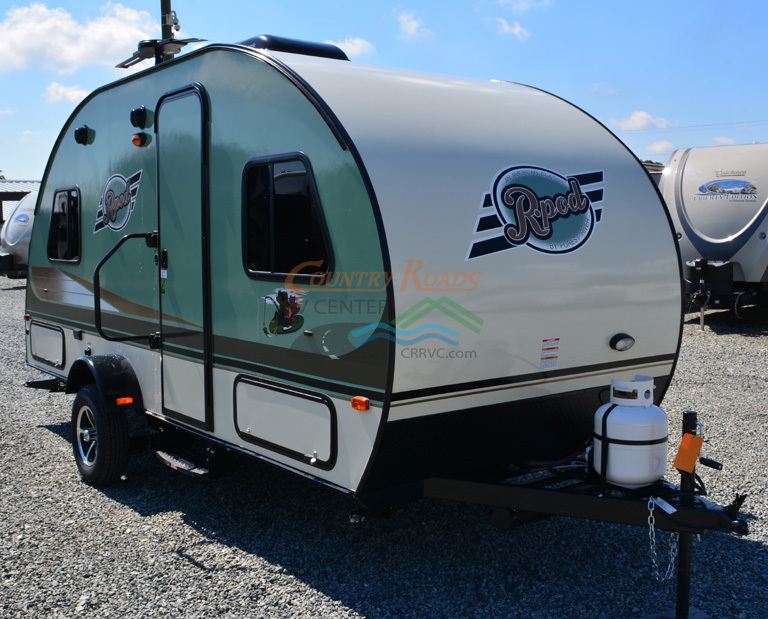 Forest River contended the Winnie Drop was “confusingly similar” to their R-pod, citing consumers who couldn’t differentiate the two trailers. 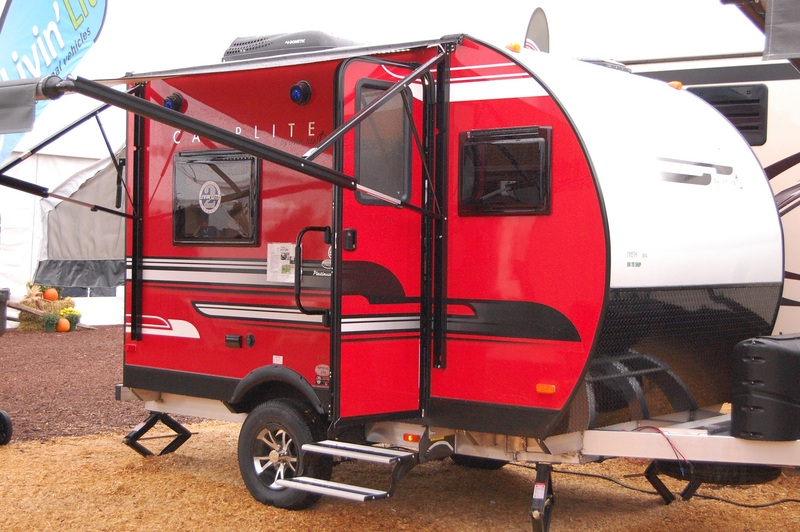 As a result of this, Forest River withdrew its suit against Winnebago. 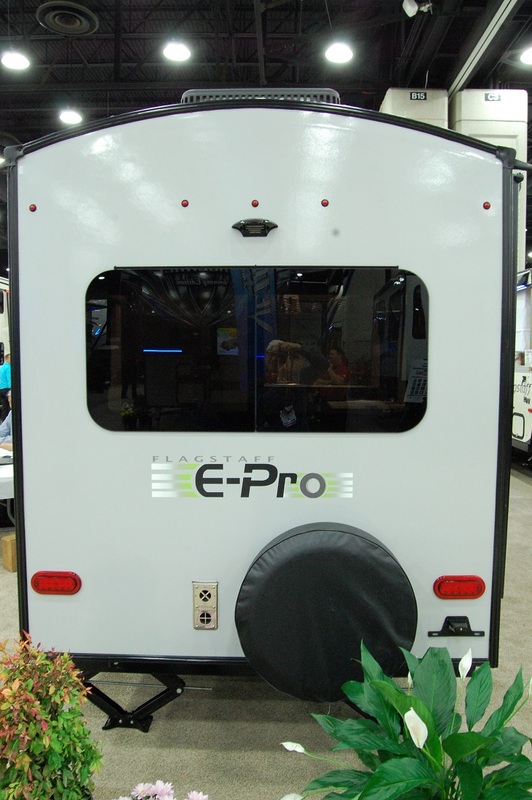 According to an article in RV Pro today, “Overall, more specific details needed to be provided for the lawsuit to constitute trade dress infringement. 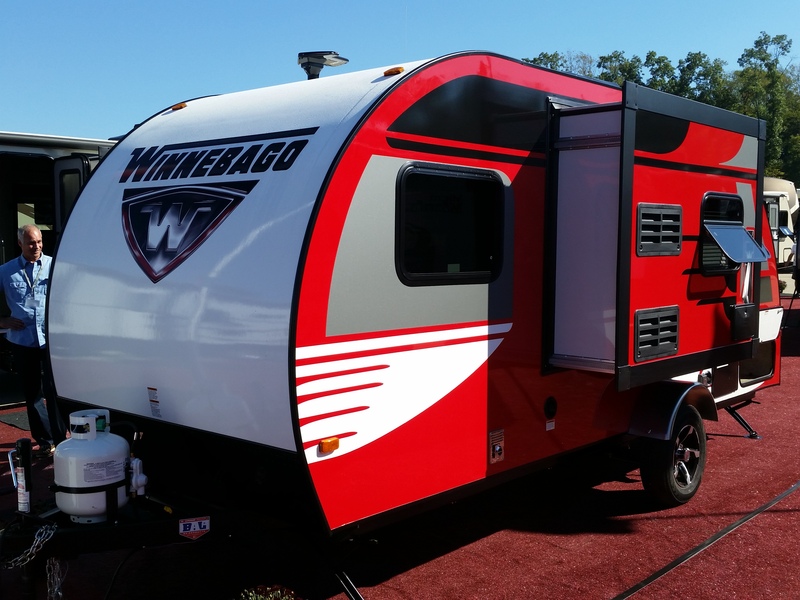 For this reason, Winnebago asked to dismiss Forest River’s claims, which the company and judge then agreed to on Feb. 14”. What does this mean? 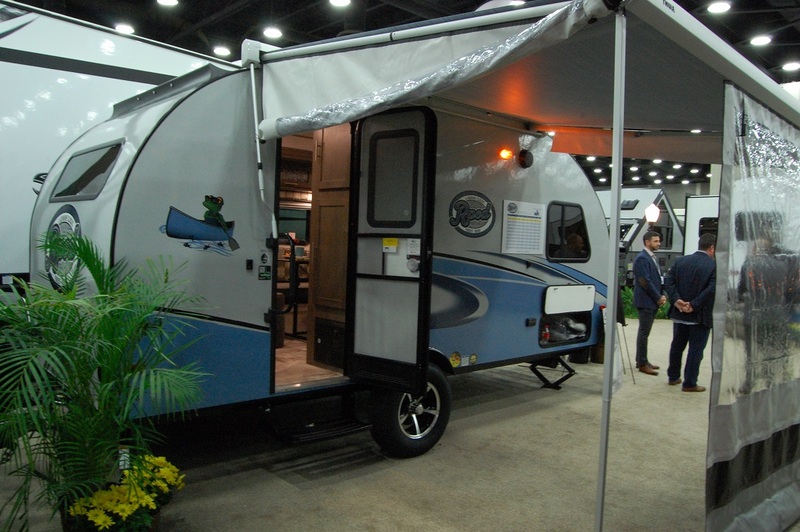 Simply, expect more R-pod type trailers to hit the market by other manufacturers. 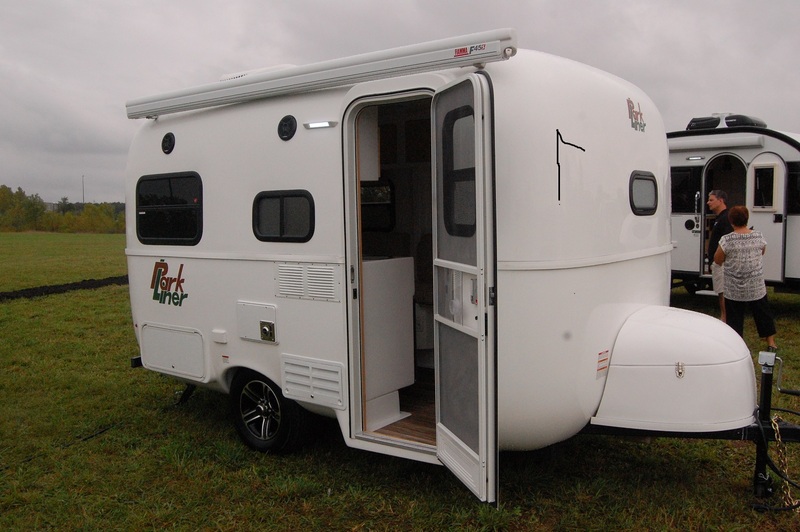 The R-pod is the top selling trailer under 20′ and expect even more manufacturers to now aim for a piece of that pie without fear of Forest River’s legal team. 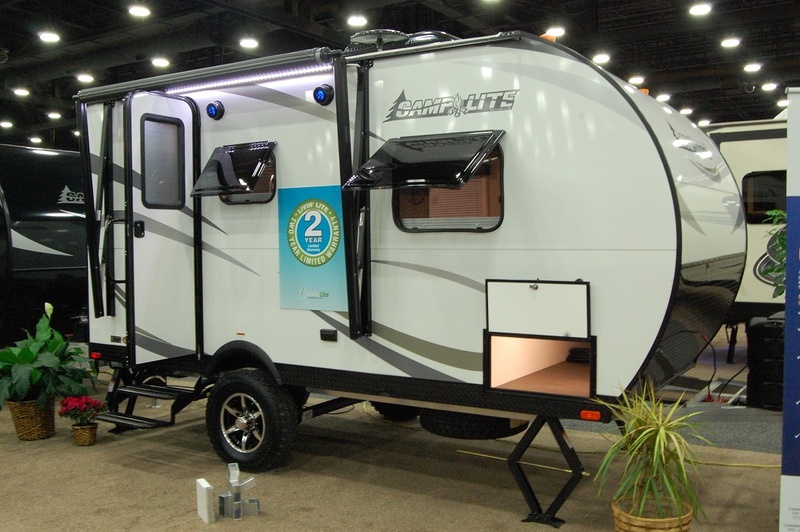 We’re already seeing new units hit the market since the Winnie Drop came out, including offerings from KZ, Keystone, Jayco, and Starcraft. 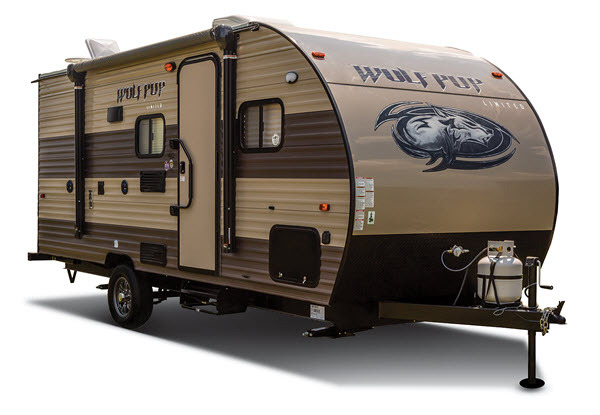 I know this has been a hot button topic for many of you, especially you loyal R-pod devotees. 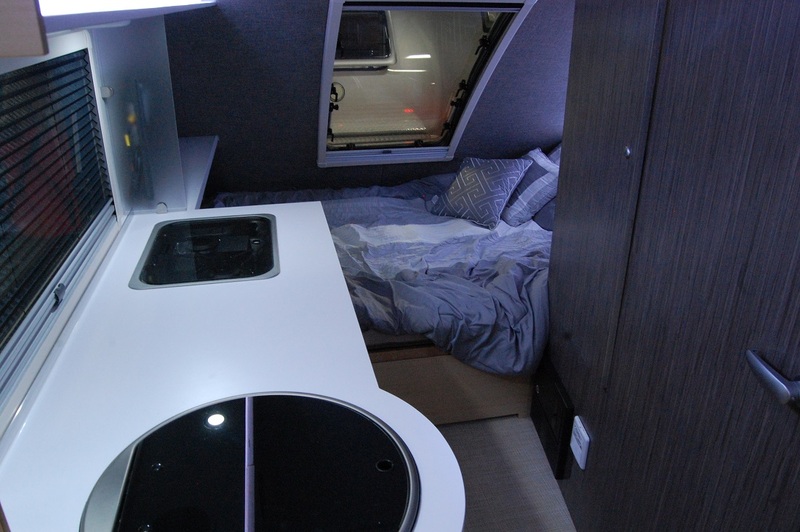 If there’s a good thing to come out of this, expect the added competition in this class to improve the quality and options among all the manufacturers in an effort to rise to that number one spot where the R-pod currently sits. I’ve always been a firm believer that competition makes you up your game, and this alone will benefit the consumer. And in the end, isn’t that what really matters? 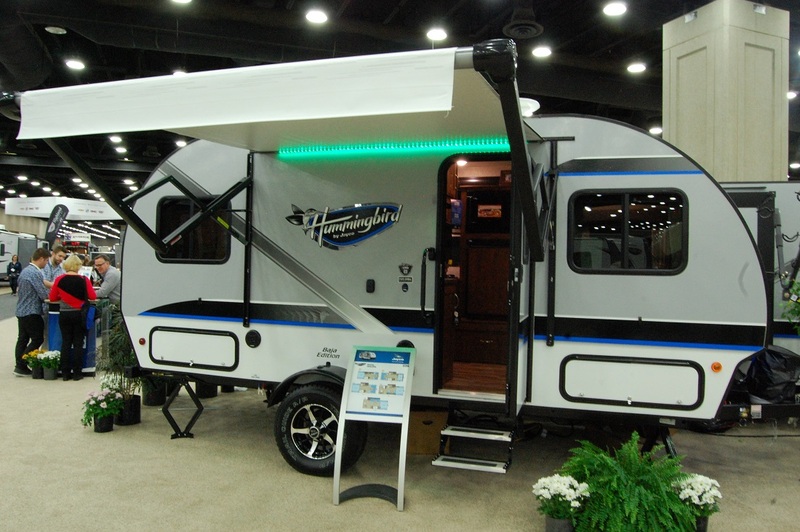 The 2016 RVIA show in Louisville featured the usual full spectrum of RVs the industry has to offer. 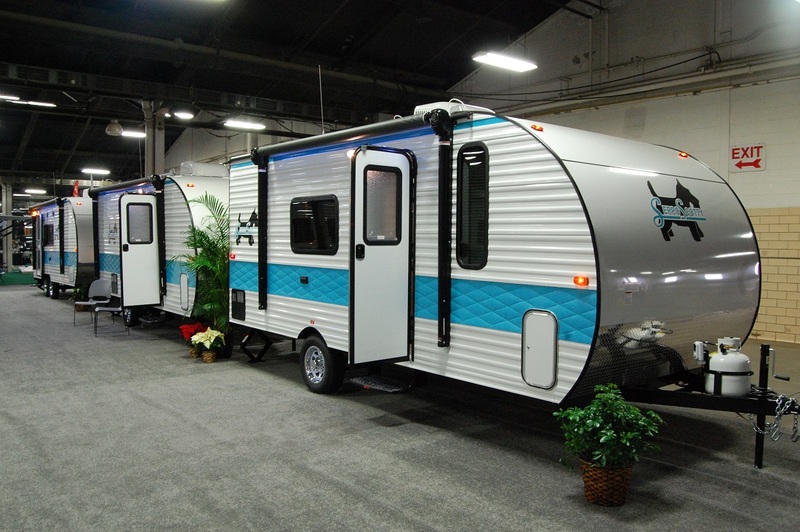 However, this year was one of the best…if not the best…of the six shows I’ve now attended for the small trailer segment. 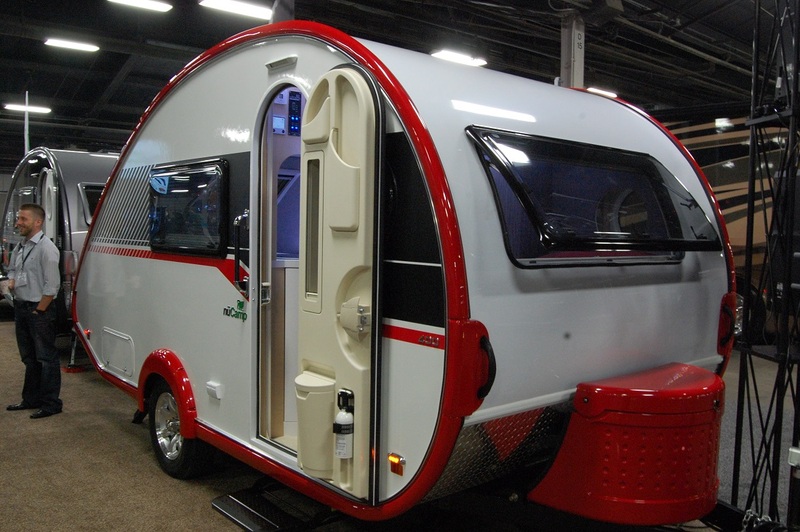 It’s no secret that this segment of the industry is gaining steam and this year proved manufacturers have embraced the small trailer culture with new, innovative models and expanded floor plans of existing models. Every year I keep telling myself that I’m going to take two days off work to attend this show, and this year was no exception. 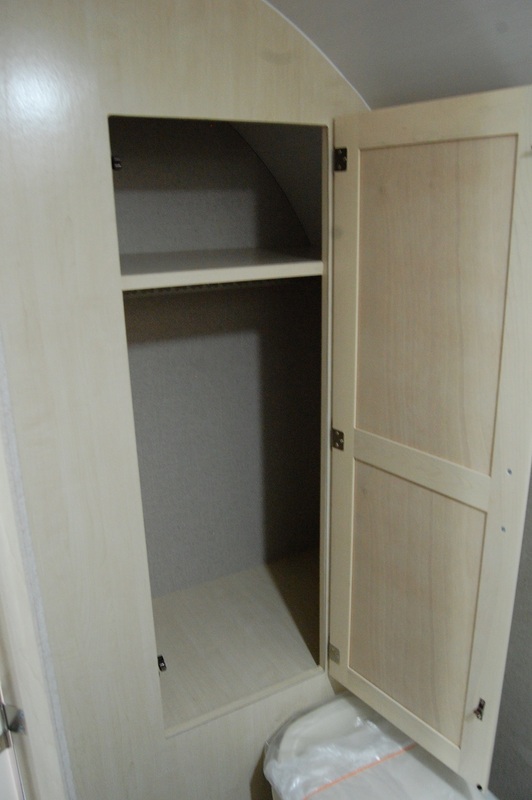 However, I packed a lot in the full day I was there on Tuesday, November 29. By the time my day was over, I logged a whopping 24,116 steps on my Fitbit, or 11.04 miles! Fortunately I bought a new pair of New Balance before the day began…and they got quite the break-in. But perhaps 2017 will be the year where I take those two days for the show, as this year I wished I had another day to talk more to some of the manufacturers about their products. Part of my day this year was spent hosting a couple from Indianapolis. 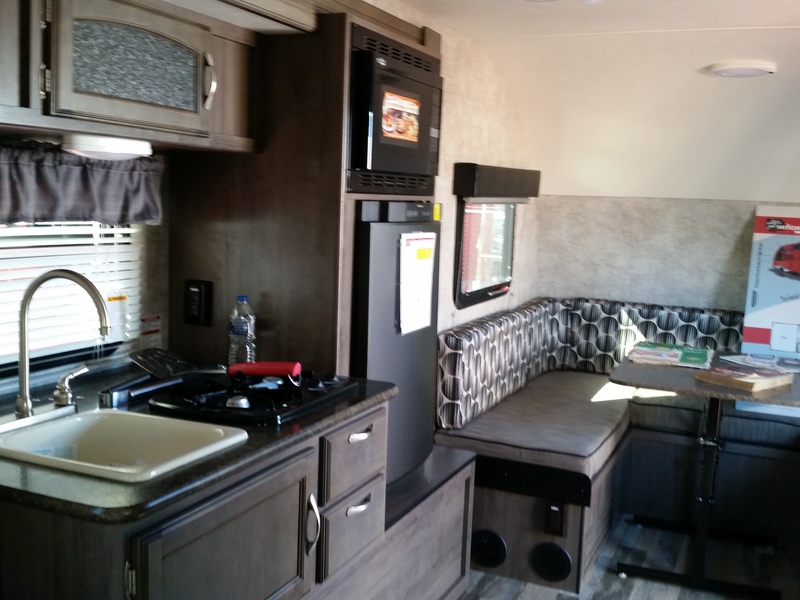 Bob & Becky Kevoian are recent retirees now traveling the U.S. part time in their 2014 Airstream International Sterling 25FB. 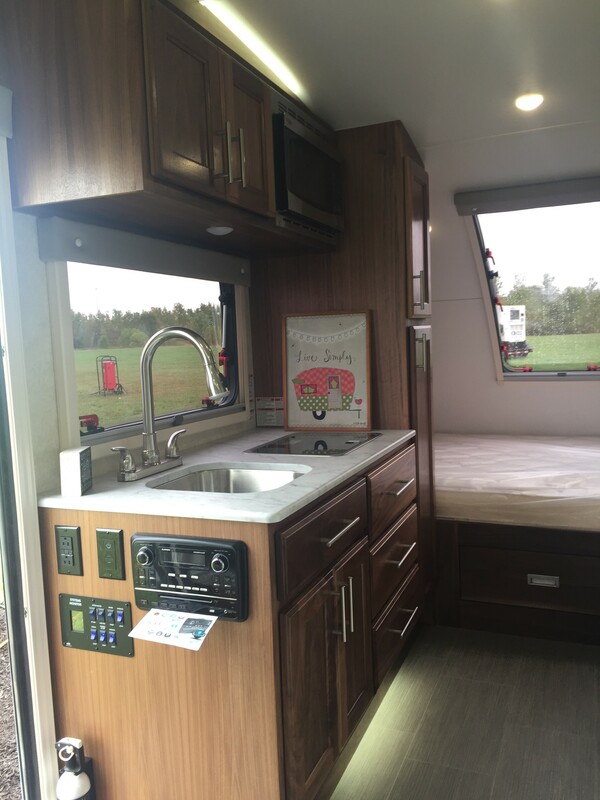 I spent a few hours with them looking at Airstreams and just giving them an overview of how physically big this show really is. Some of you may recognize Bob and his signature LA Dodgers cap. For more than 30 years, Bob was half of the Bob & Tom Show, a nationally syndicated morning radio show based out of Indianapolis. Once Bob hit 65 in December of 2015, he signed off the air for the last time, although the show still carries on with his name. 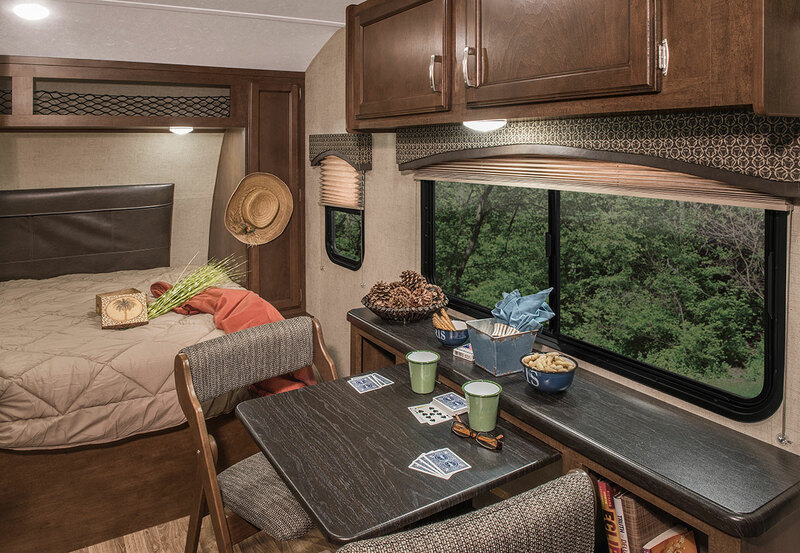 Following his retirement and induction into the national radio hall of fame late in 2015, Bob and Becky have been enjoying the past year spending much of it on the road in their Airstream. 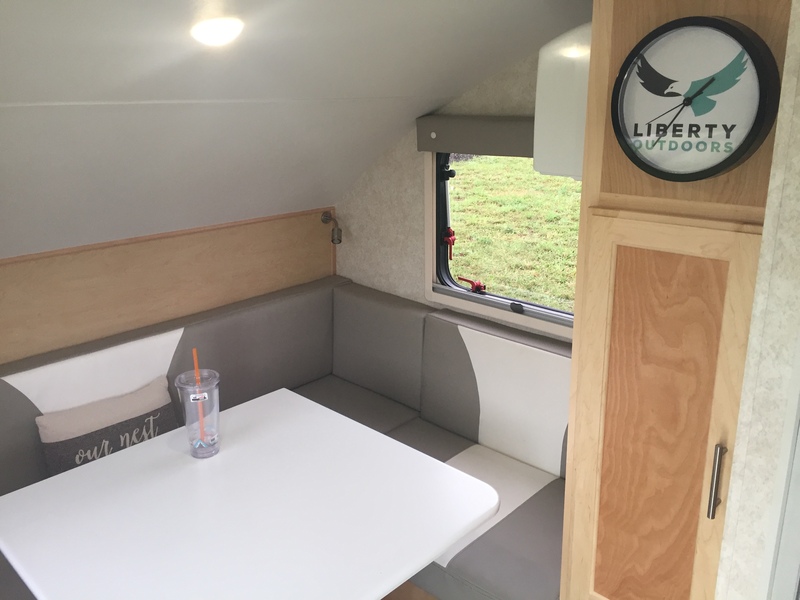 Earlier this year, they started a podcast as an accompaniment to their blog about their Airstream, affectionately called “June Bug”. 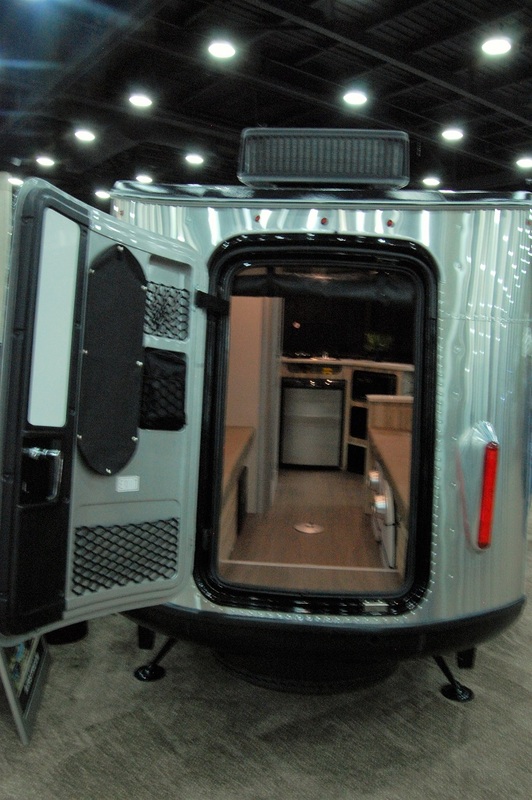 You can follow along on their adventures at their website, junebugjourneys.com where you can catch up on travel updates and listen to their recent podcasts. 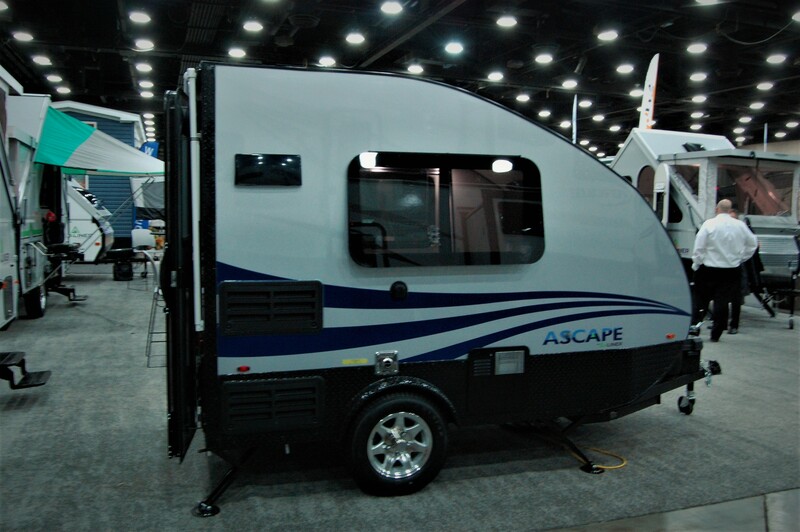 One new offering from Aliner is the Ascape. 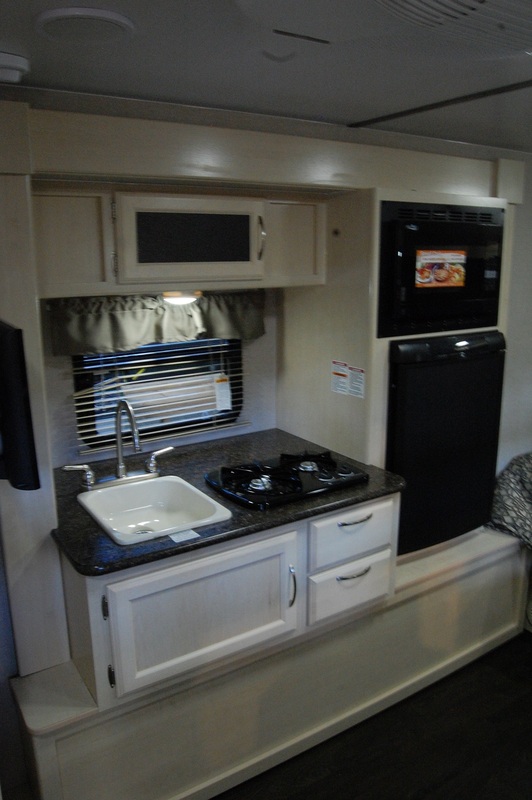 It’s a rear-entry unit that’s loaded with everything a single person needs for a comfortable weekend. 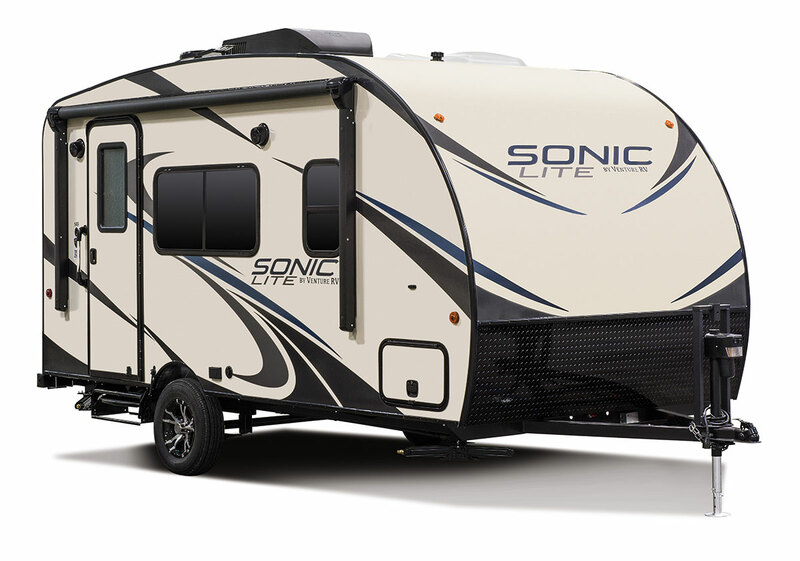 And at just 13 feet long and 1350 lbs, it’s towable by a lot of smaller vehicles. 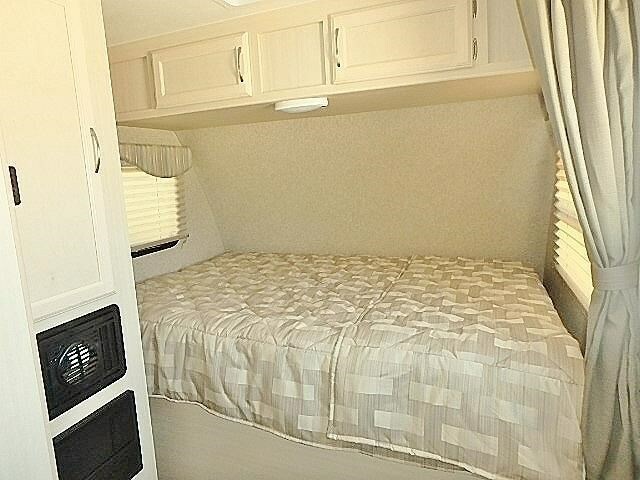 It’s not yet up on their website, but look for prices in the mid teens. 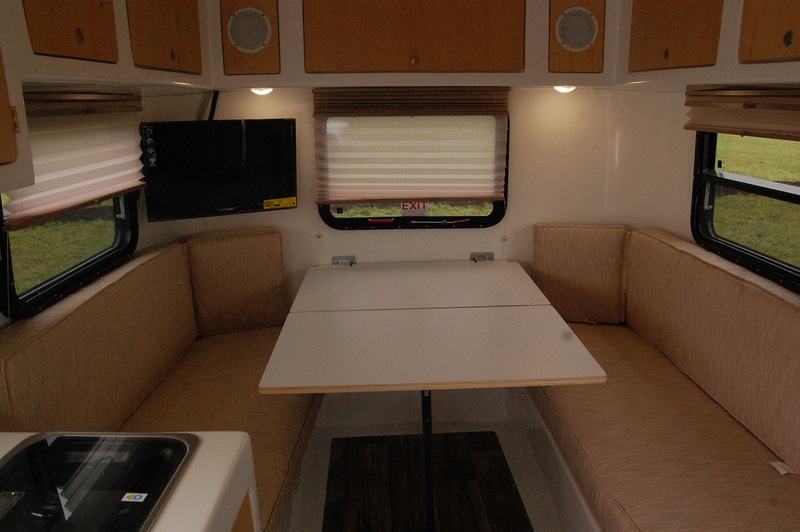 The Plus model adds air conditioning, cassette toilet, audio/visual package, and awning. 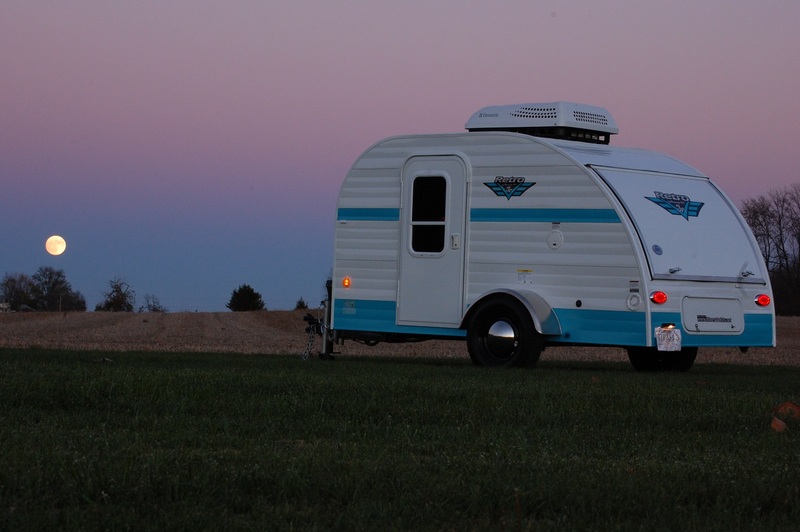 The Travel Lite Falcon is one that easily attracts. 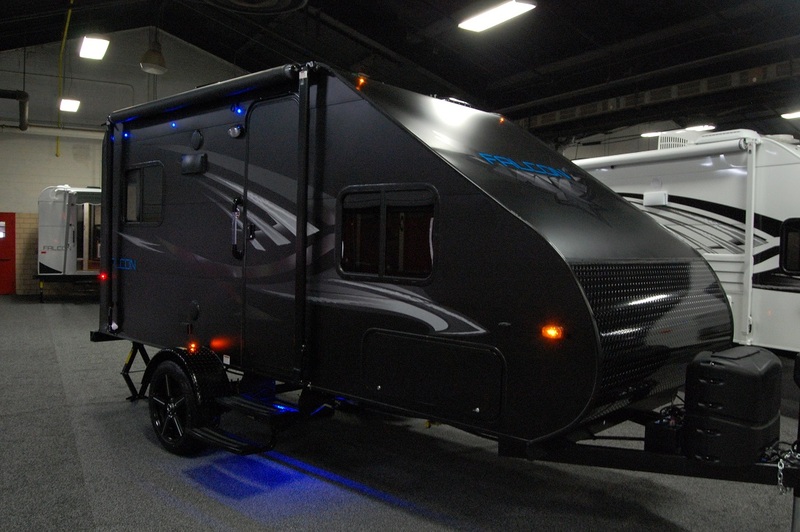 While Travel Lite is known mainly for truck campers, in recent years they’ve introduced travel trailers to their lineup and have added to that lineup the slick looking Falcon. 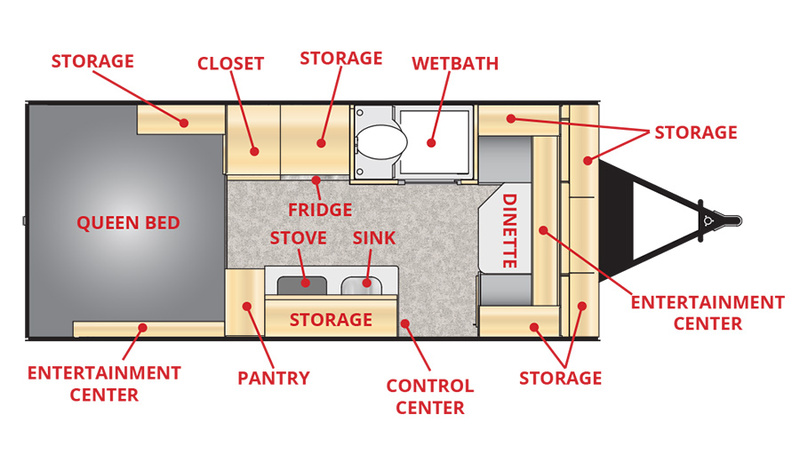 It comes in five floorplans and weights ranging from 2480 to 3215 lbs. 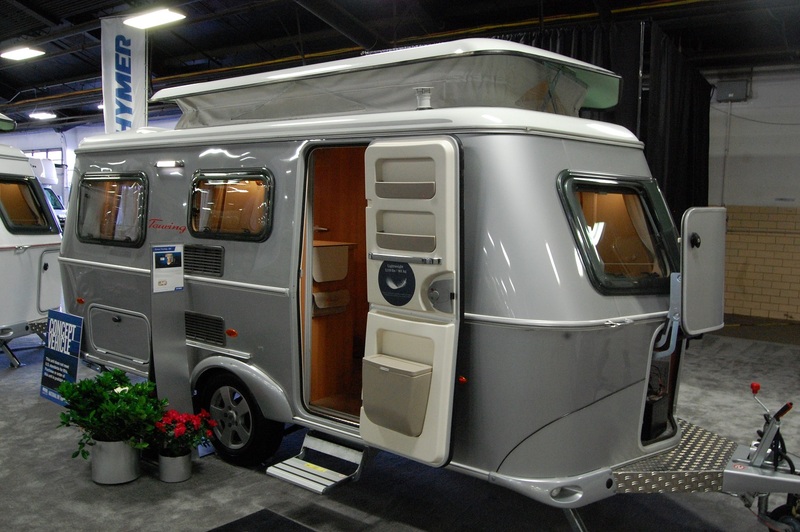 They’re skinned in smooth aluminum and come on 18″ to 20″ wheels, depending on whether the floorplan has a slide or not. 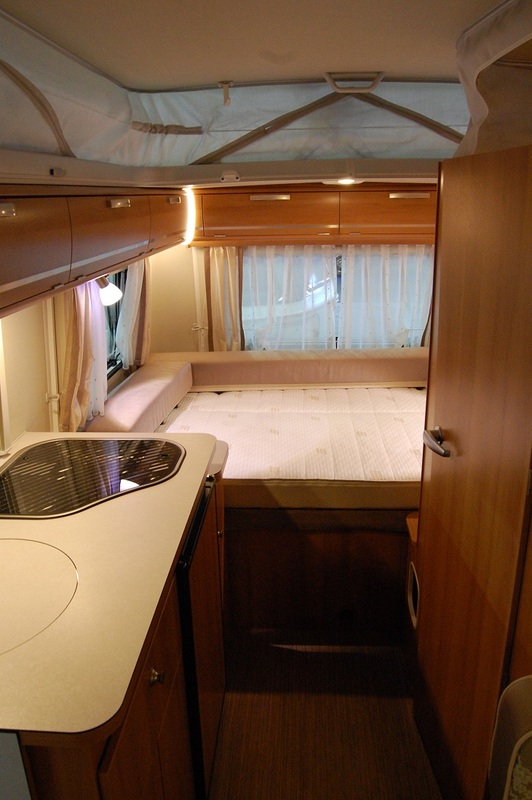 Very good looking unit with good looking interiors. 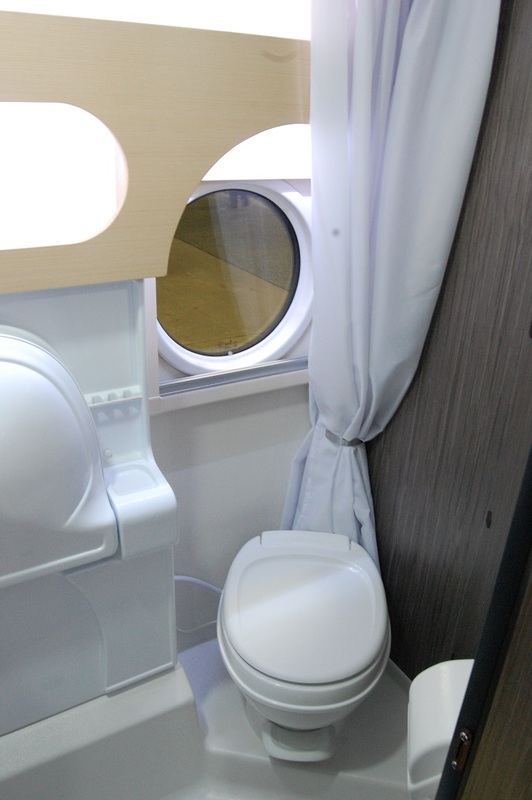 Very nice change from the industry norms. 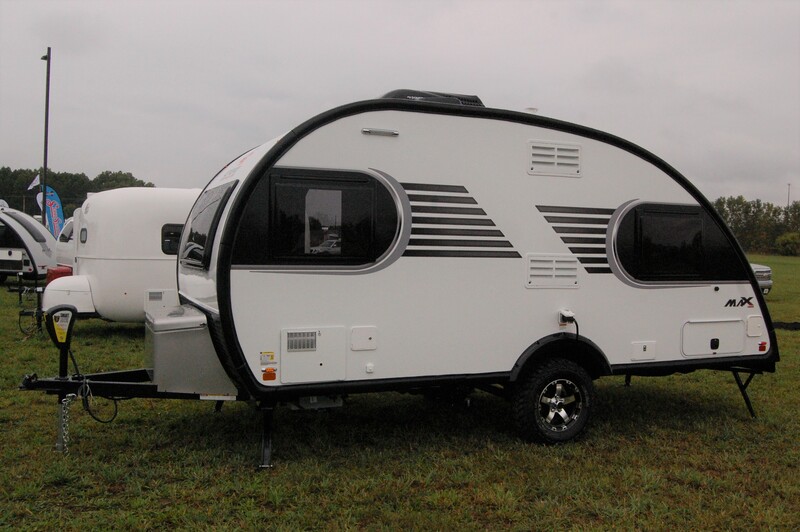 Forest River is also coming out with some innovative smaller trailers. 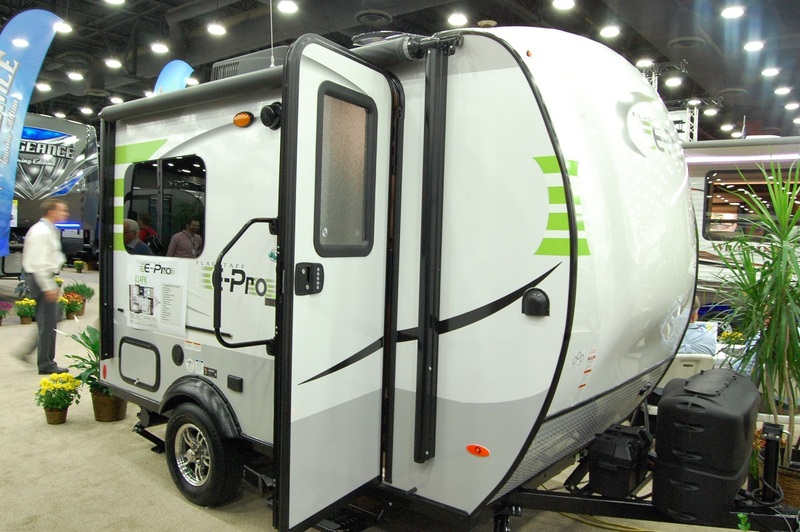 Rockwood’s Geo Pro and Flagstaff’s E-Pro should be out sometime in the first half of 2017. 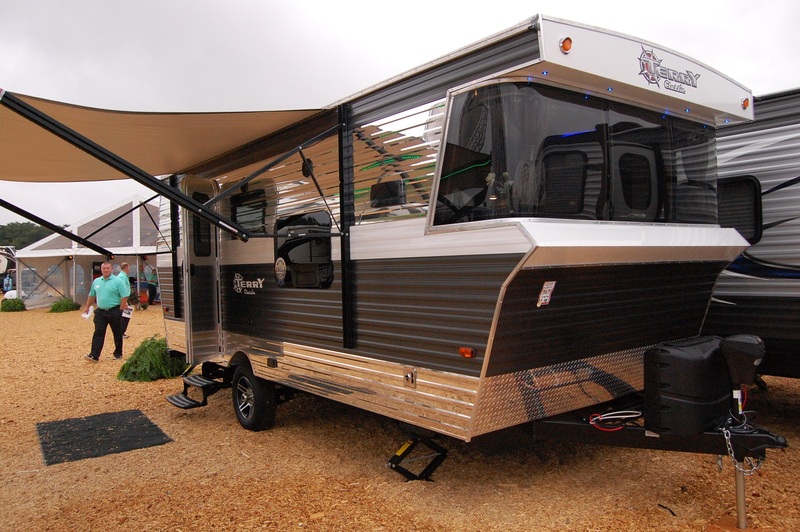 Geared toward “those campers that value being environmentally conscious and have chosen to drive today’s more fuel efficient crossover vehicles and small SUVs”. 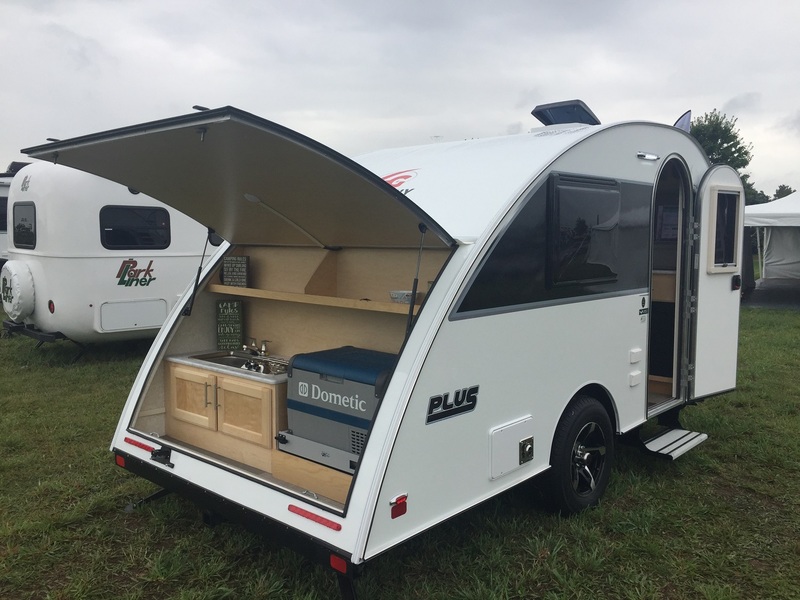 An A-frame bike rack, flexible roof mounted solar panel, and 12 volt 19″ TV are just a few of the options these two essentially identical trailers will offer. 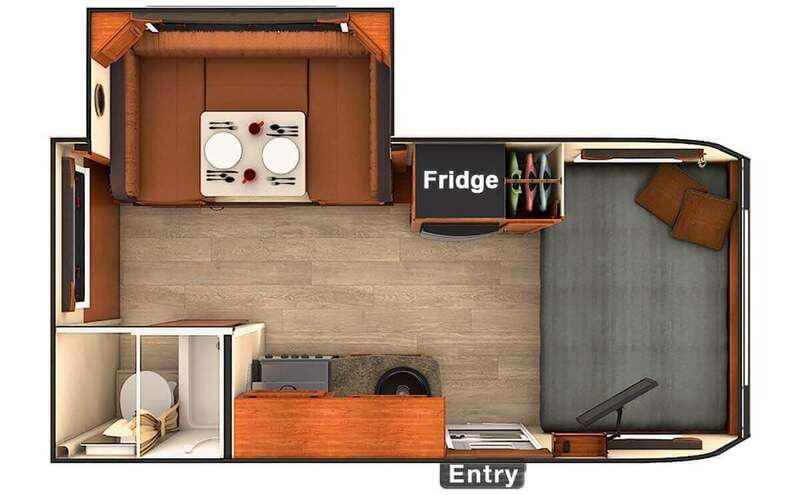 They’ll have five floor plans to choose from, with the smallest being a teardrop style that has a rear kitchen and a bed you crawl into from the outside, not unlike a teardrop, but not shaped like one. 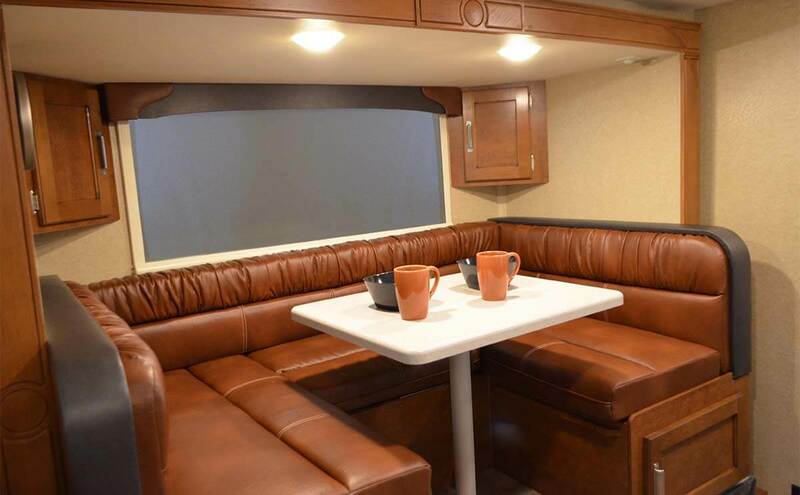 The particular model in these photos (the 14K) has a spacious U-shaped dinette that converts to a bed and also has a wet bath next to the front kitchenette. 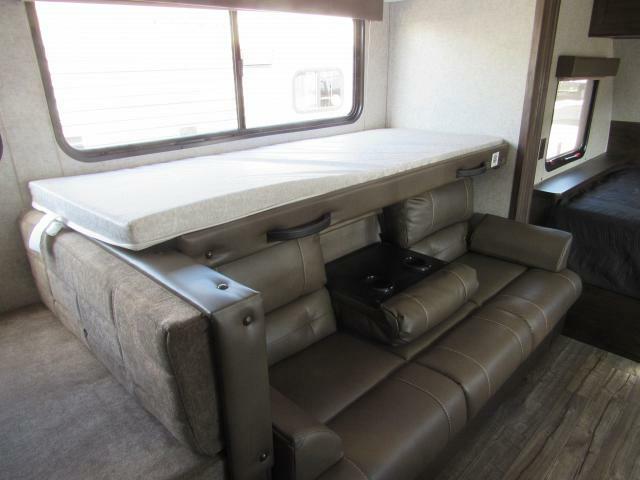 It has an unloaded vehicle weight of just under 2,000 lbs and is 14′ total length. 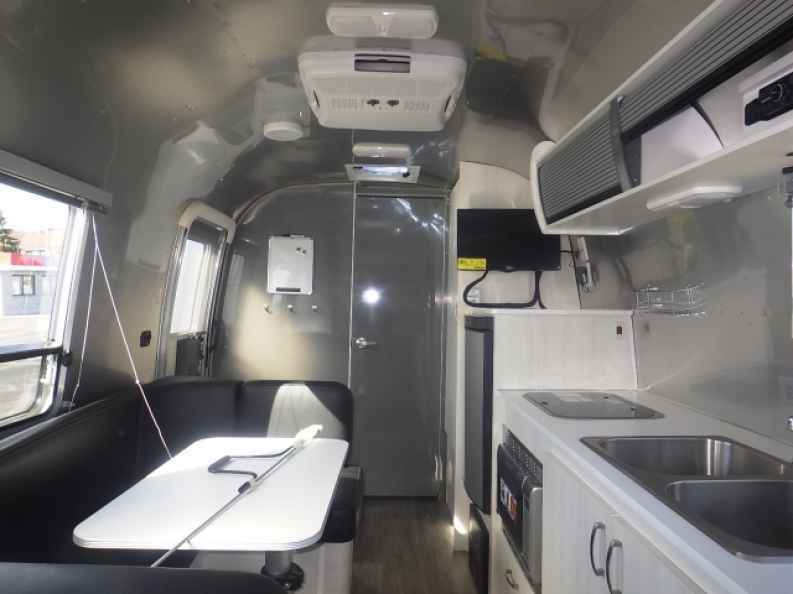 Airstream’s introduction of the redesigned Basecamp happened a couple of months ago, and units are just now starting to show up on dealer lots. 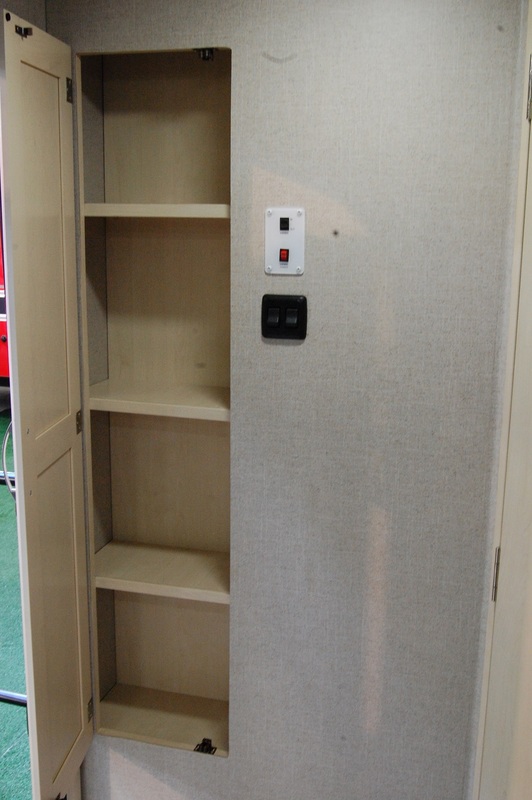 The first incarnation of it occurred in 2008, and it was really nothing more than a small utilitarian designed unit that never gained traction with the public. 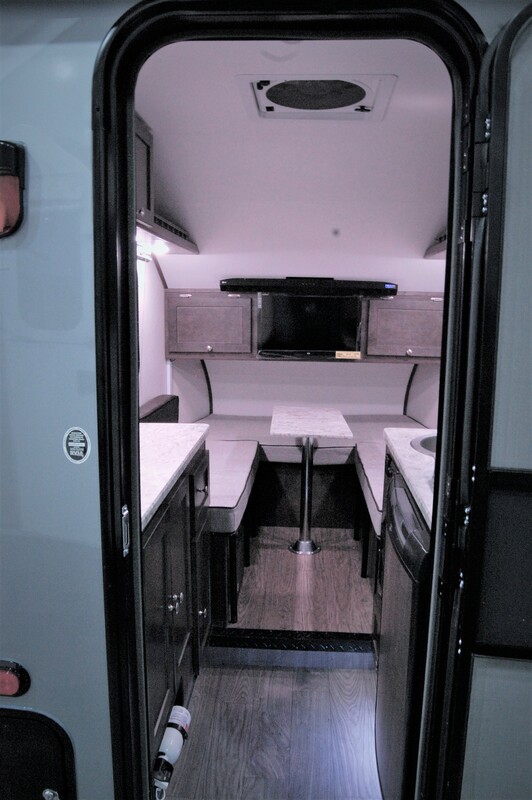 After lasting just one year, it was shelved and reintroduced this fall with a new interior package and redesigned on the inside while keeping the same overall shape it had in 2008, with the addition of a side entry door, wet bath, and a few more touches to give it more of a micro travel trailer feel on the inside. 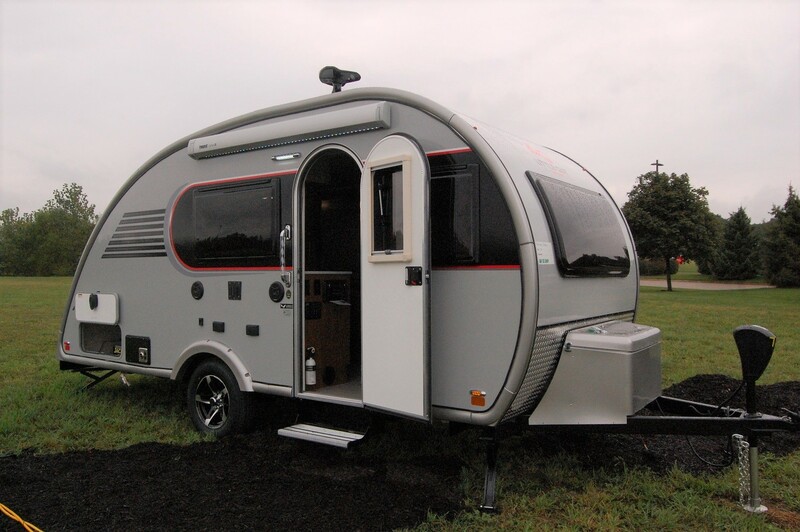 So far, feedback has been positive and Airstream has been advertising this thing hard on social media. 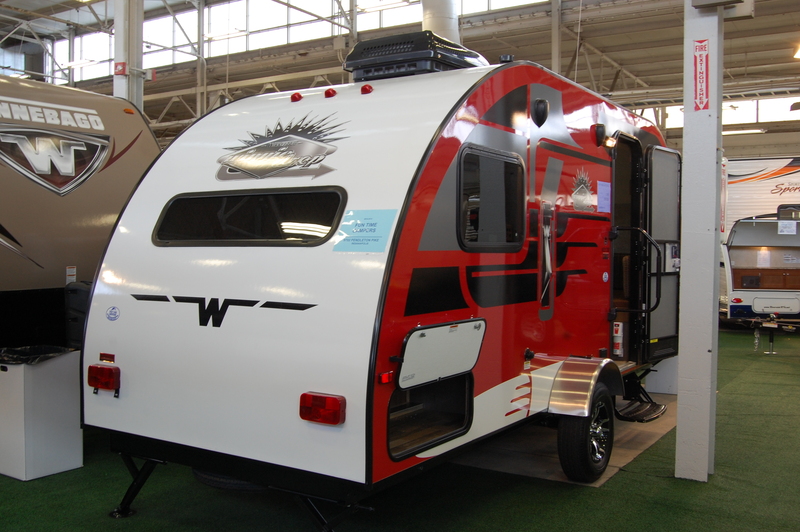 There were two units on display in Louisville, with one showing the additional tent rooms that can be added to both the side and the rear of the Basecamp. 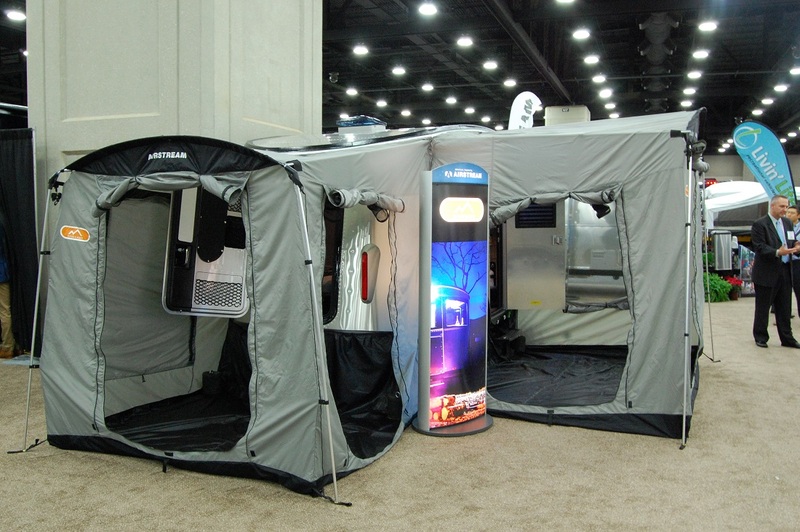 There was also one without the tents to show the sleek design of the Basecamp uninhibited by the tent rooms. 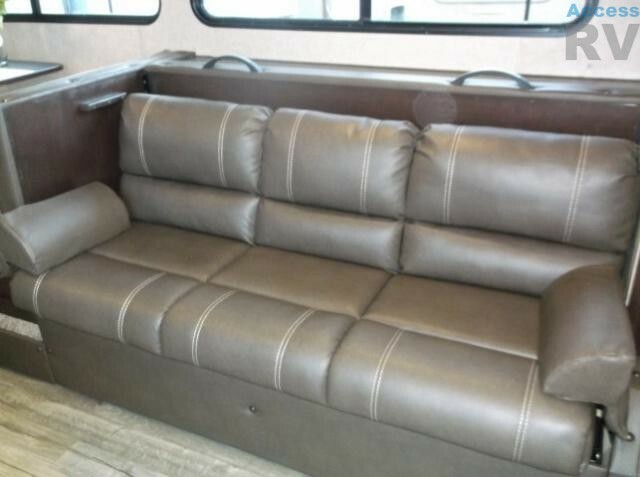 The MSRP was a cool $38,000 on the one I looked at. 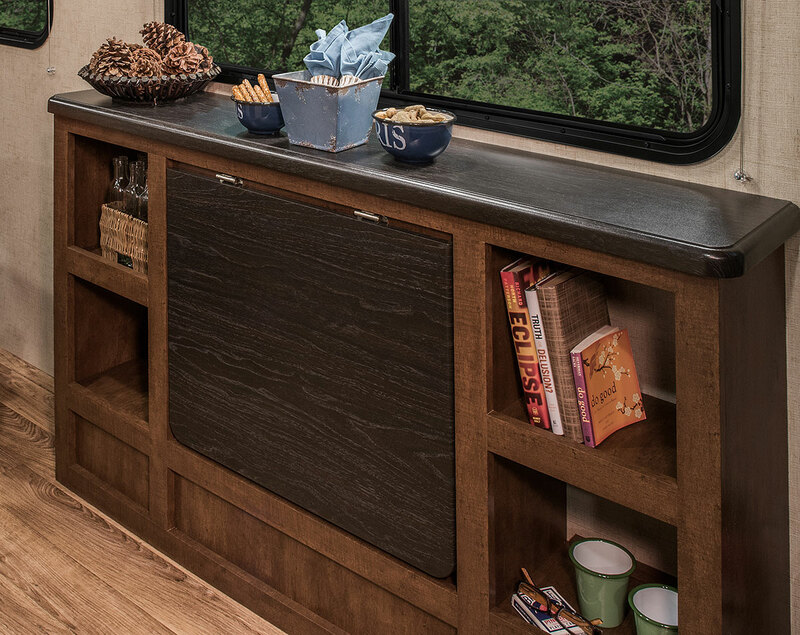 Airstream appears to be marketing it towards millennials and those outdoors recreationalists that you would typically find camping off the grid and not in a typical campground. 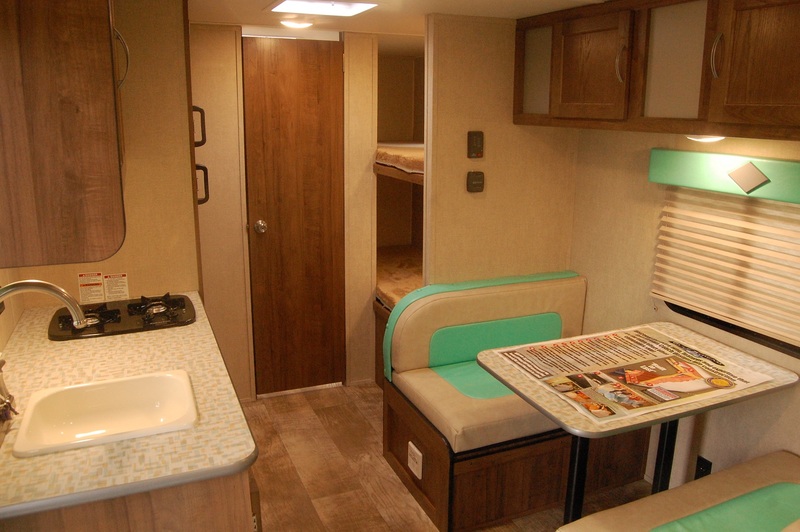 I’m not sure of too many of those 20-somethings who could afford that price tag when you consider their likely school debt and other financial and career obstacles that generation faces. 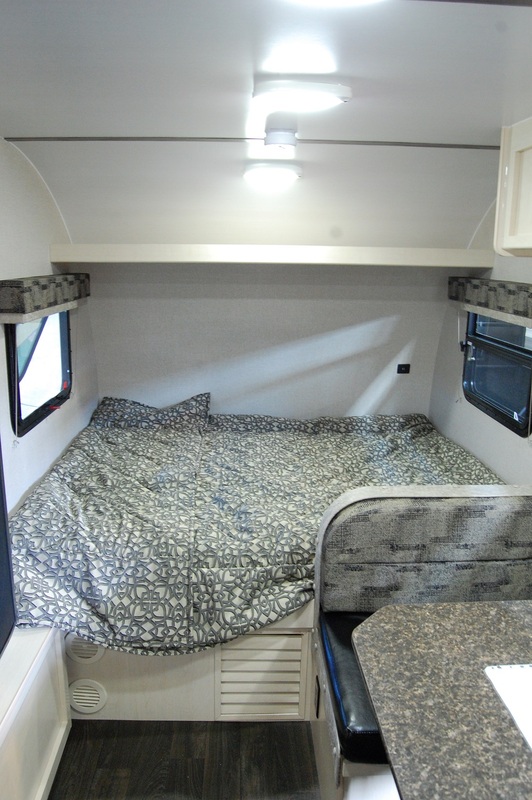 Time will tell on the Basecamp. 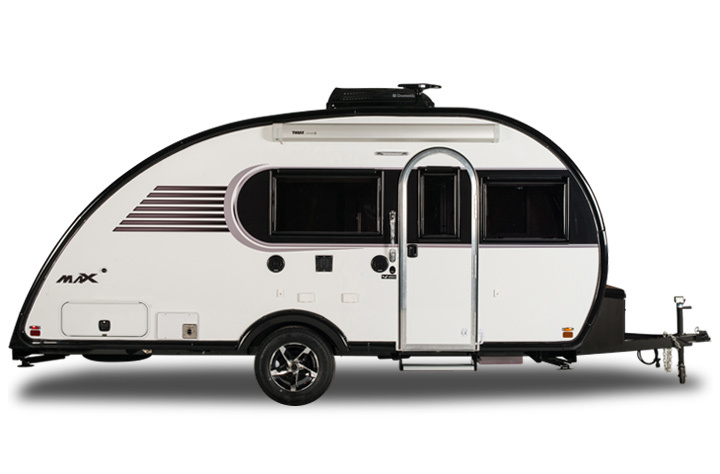 If it were me looking for an Airstream in that size and price range, I’d go with a traditional 16′ Bambi Sport for about the same size, weight, and money. 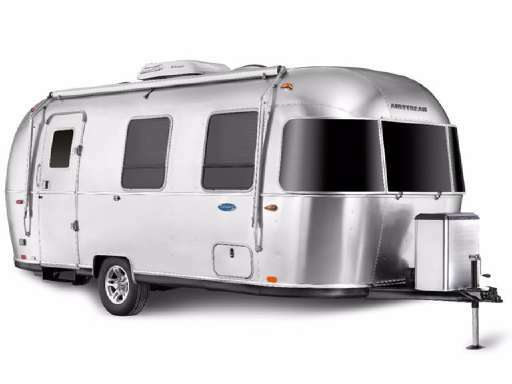 After all, if you’re buying an Airstream, don’t you want it to look like an Airstream? 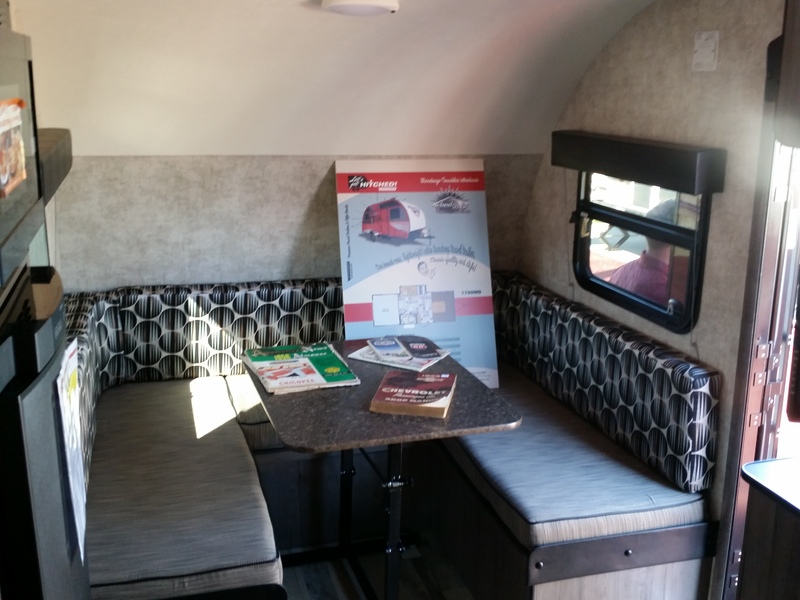 Debuted at the Elkhart Open House in September, Heartland RV again had the yet to be named prototype retro trailer. 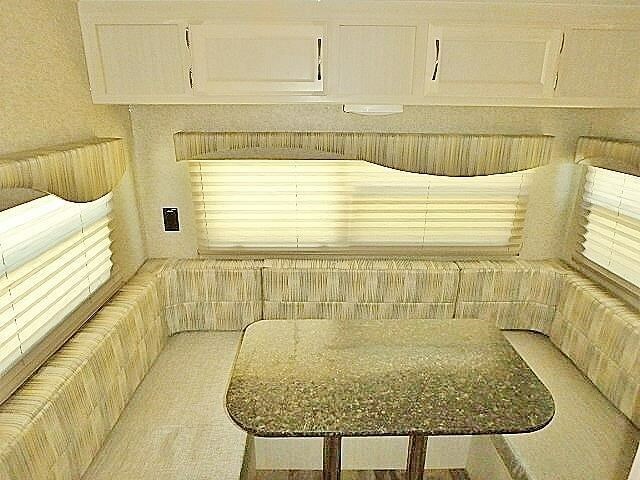 Its look harkens back to the classic Holiday House built in the early 1960’s. 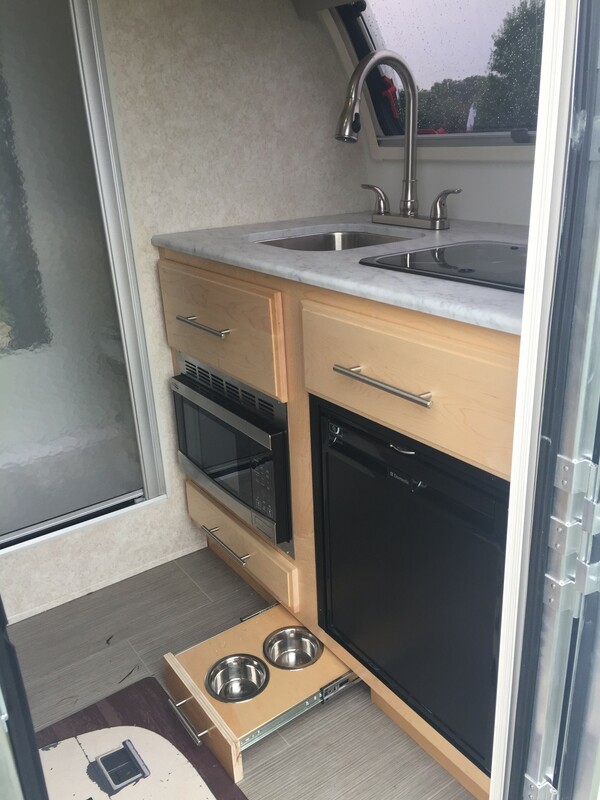 Whether it makes it to production remains to be seen. 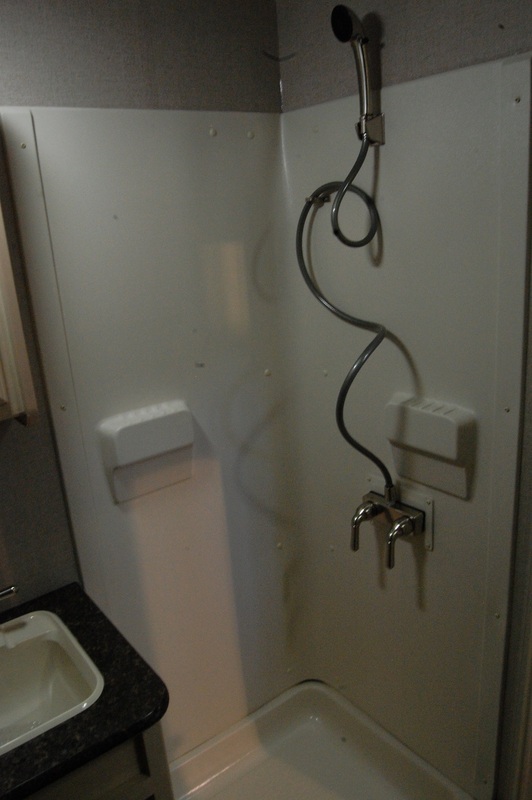 Although it’s a single axle trailer, it’s got some bulk to it. 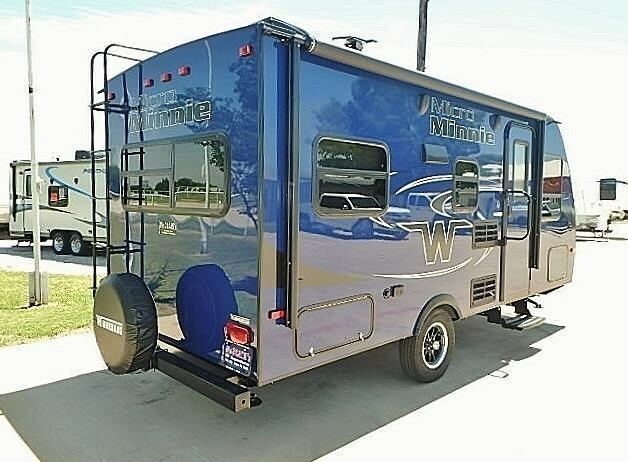 It sits pretty tall and although I didn’t see a weight on it, it’s weight is likely well north of 3,000 lbs and I wouldn’t be surprised if it’s darned close to 4,000. 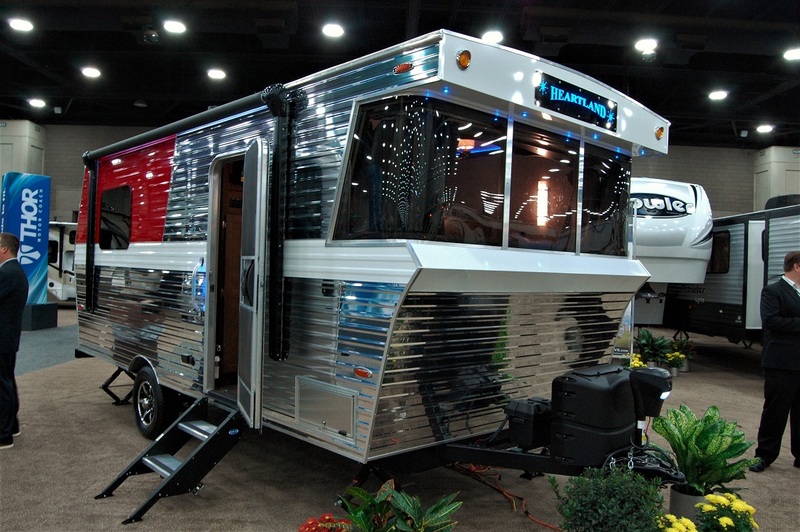 More than one industry professional I talked to about it said that while it’s got a great exterior look, the interior is a little too modern looking and somewhat brings down the trailer as a whole. 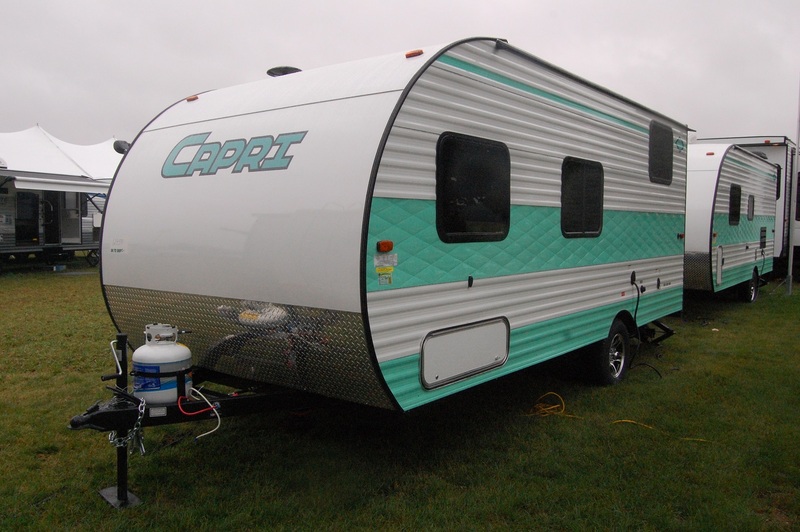 Another one that debuted at Elkhart which was a big draw at Louisville was the T@B 400 by nuCamp RV. 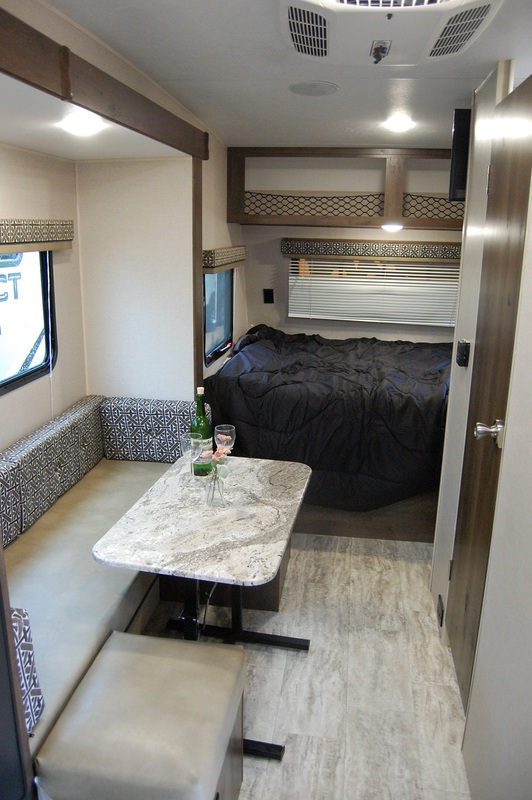 About 3 feet longer and a foot wider than a traditional T@B, the 400 will weigh in the 2300-2600 lbs range with a 6’7″ of head room. 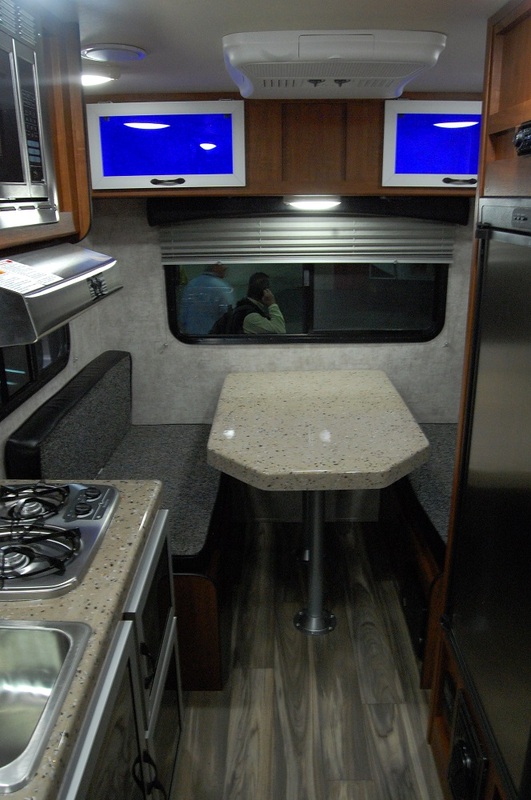 The T@B 400 gives what a standard T@B doesn’t: a separate dinette and a separate bed. 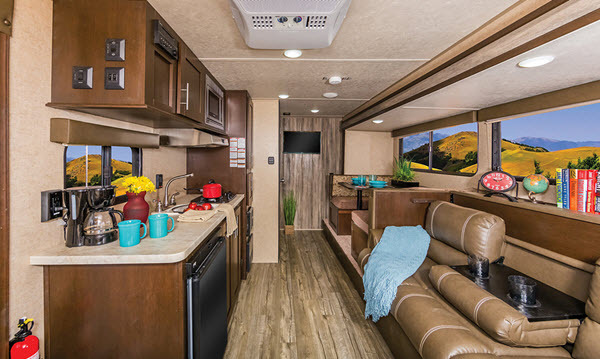 One look at the interior styling of the 400 and you’ll immediately know that it takes cues from its European counterpart. 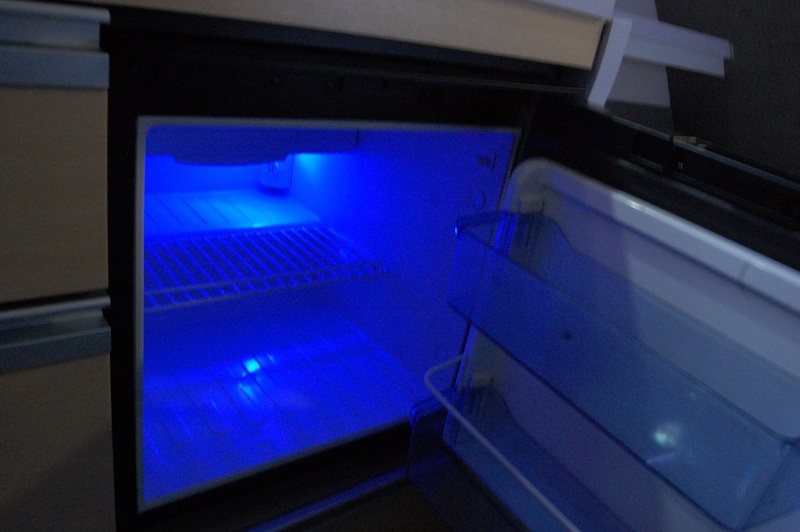 I’m sure it’ll gain the favor of loyal T@B owners, but I’m not sure about the fridge. 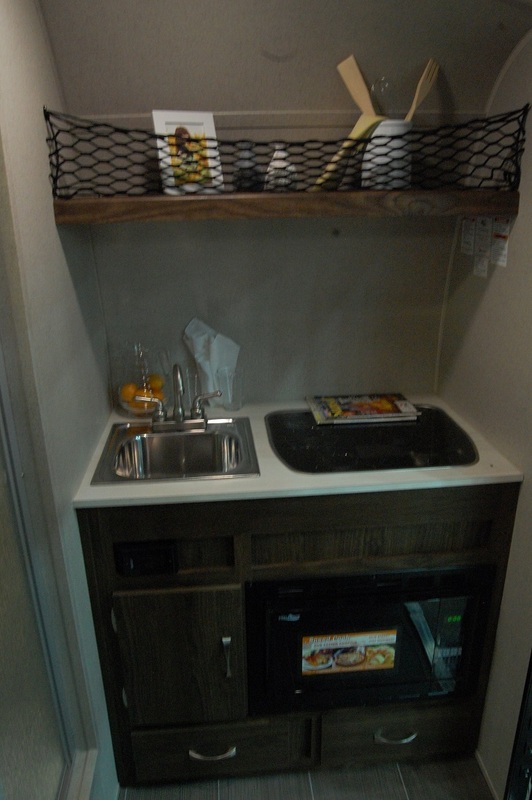 For the size of the trailer, the fridge seemed to be lacking in size, as it appears to be down in the 2 to 3 cubic foot range. Look for it to go into production early in 2017.
and everything in between, you WILL find what you’re looking for. 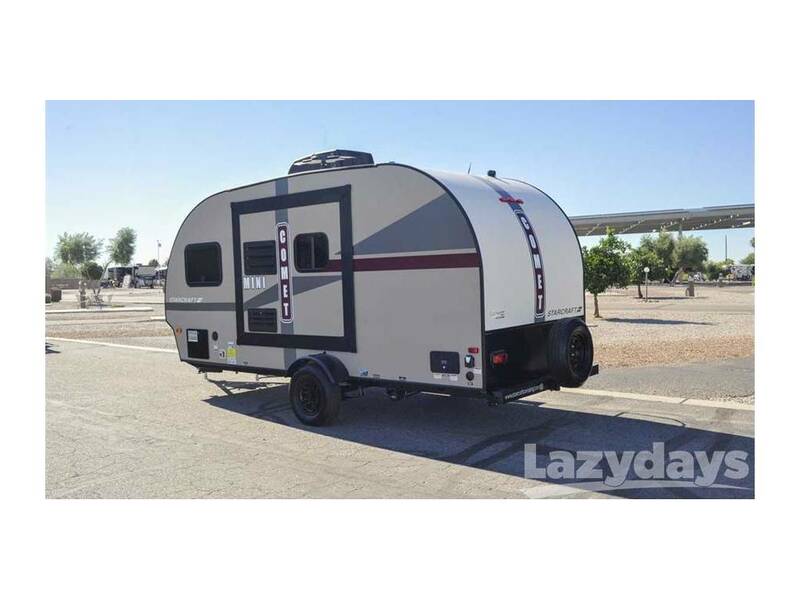 This is a fantastic time to be in the market for a trailer less than 20′. 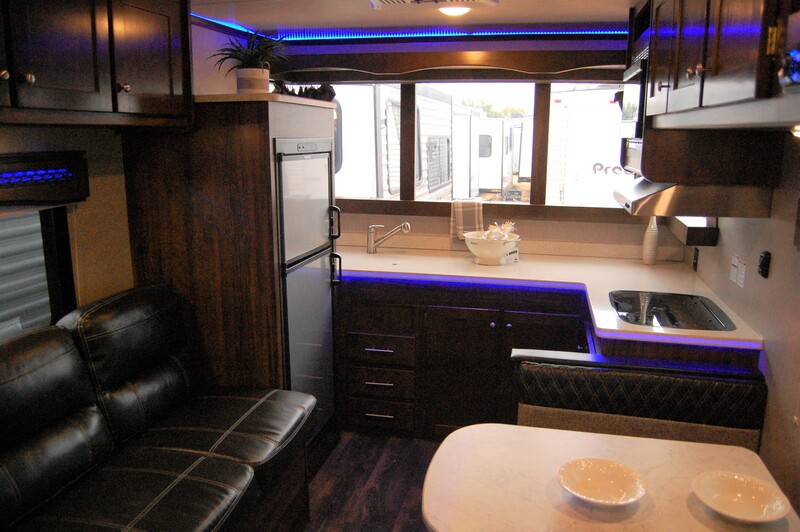 Your styles and options are vast and there’s something out there for every budget. 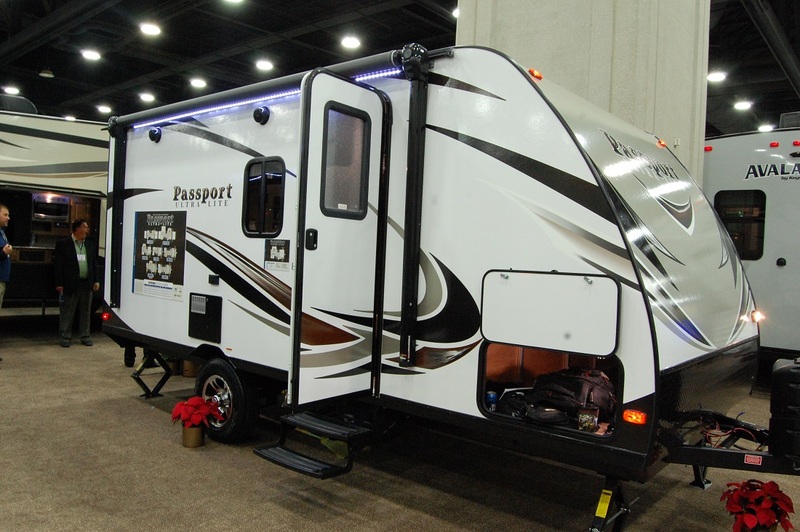 So as winter is upon us, start looking for those RV shows in your area, and get out there and see what’s available. 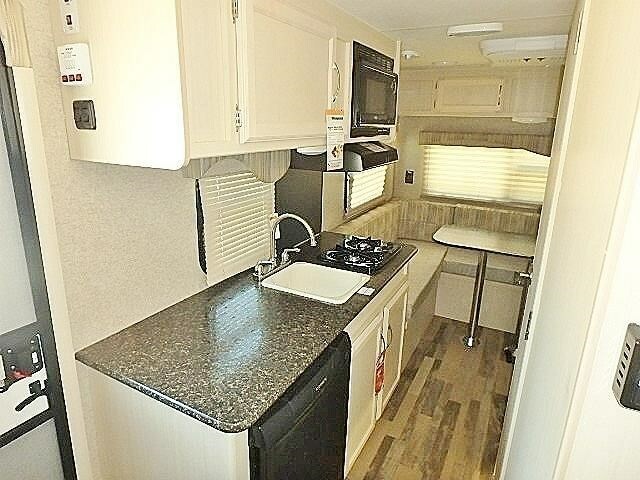 Kick the tires, find a floor plan you like and compare brands. 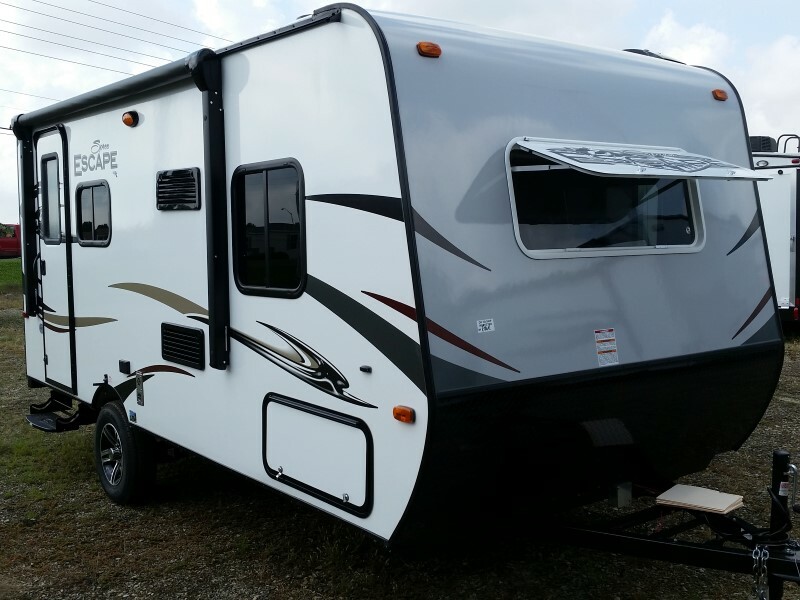 Ultimately you will find what you’re looking for in time for the 2017 camping season. 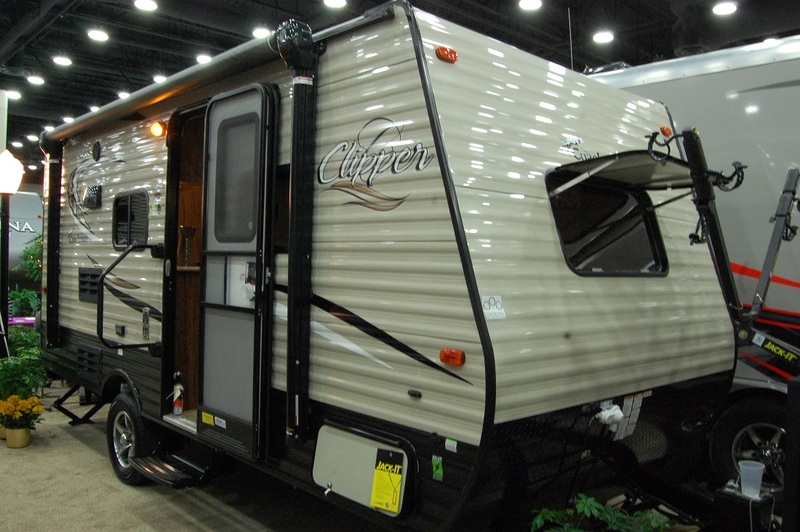 There were a lot of other brands out there that brought models in the 19′-21′ range, but I just touched on a few. 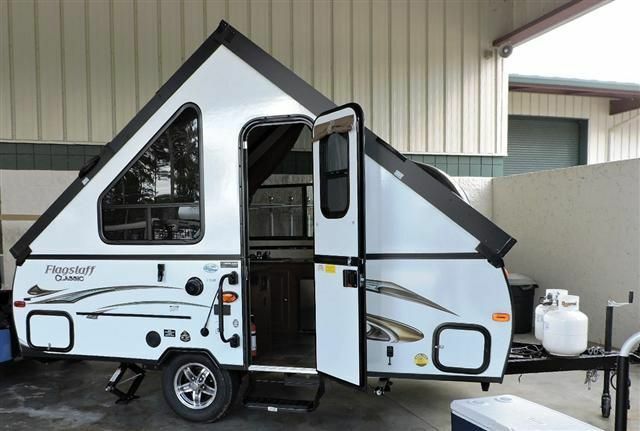 I’ll be updating the Manufacturer’s Page to include some of the new models set to hit the dealer lots in 2017. 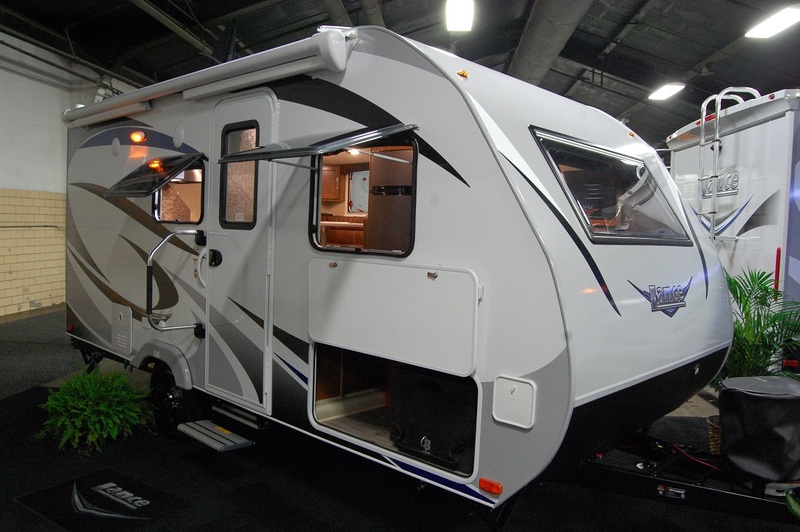 And stay tuned this winter where I’ll highlight some of these new models that I’ve discussed here. 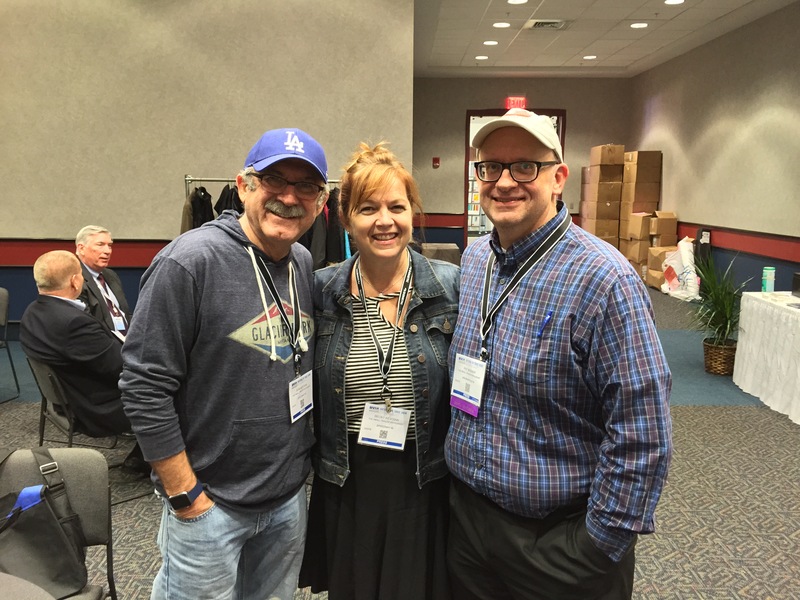 Thanks for reading…and may you all have a great holiday season! 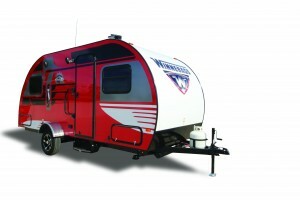 Hooking on to the popularity of the r-Pod and Winnebago Winnie Drop, Starcraft RV has recently introduced its own offering to the teardrop inspired 18′ to 20′ travel trailer segment. 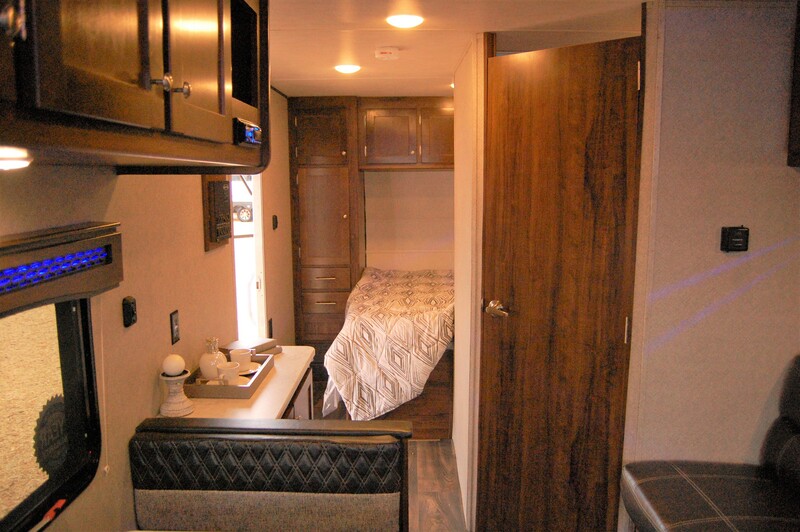 The Comet Mini offers four different floor plans ranging from 19’11” to 20’8″ lengths. 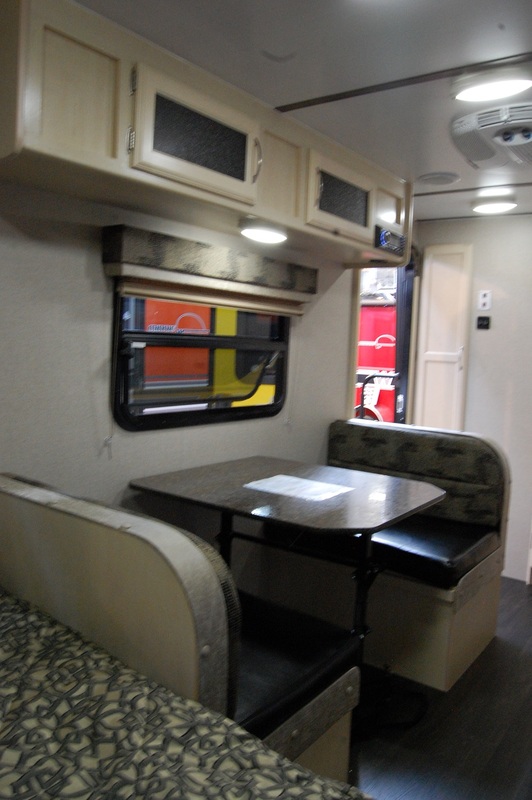 With dry weights from 2708 lbs to 3055 pounds, it makes it towable by most mid size SUVs at a minimum. 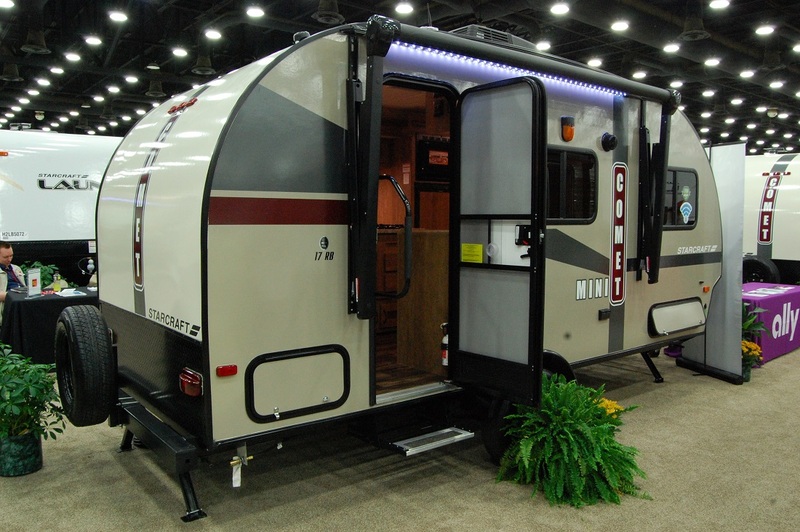 To keep it lightweight, the Comet Mini offers an aluminum cage and laminated sidewalls. 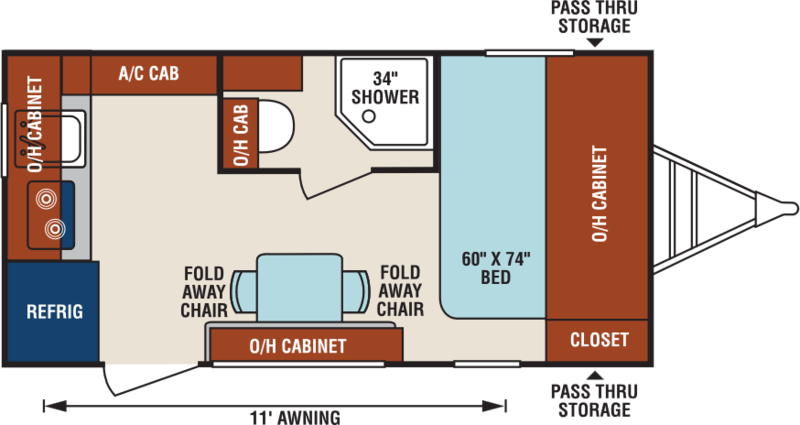 The floorplans offered aren’t any different than any what r-pod, the Winnie Drop, or the Jayco Hummingbird offer, so all else being equal, this gives buyers an apples to apples comparison where they can narrow their choice down to options, color schemes, and prices. 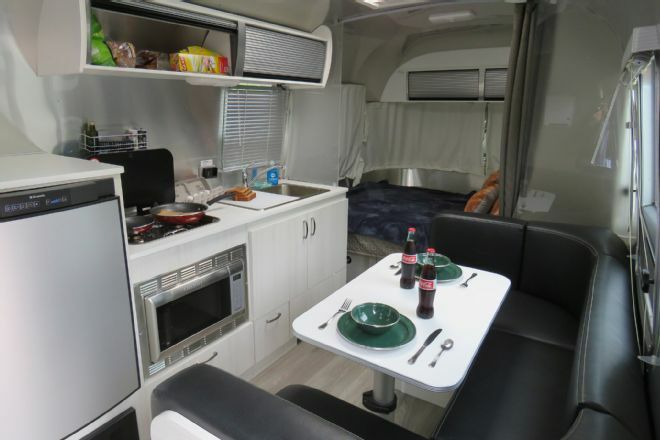 Standards include a convection microwave oven and upgraded pleated night shades, as well as optional 13.5k air conditioning, electric awning, electric tongue jack and bumper mount grill. 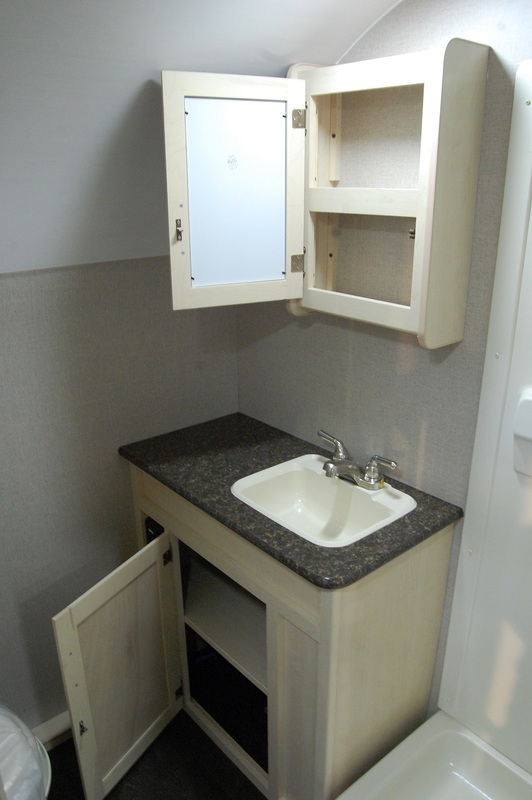 Interior-wise, I really like the tone of the sugar maple cabinetry when compared to some of its competitors. 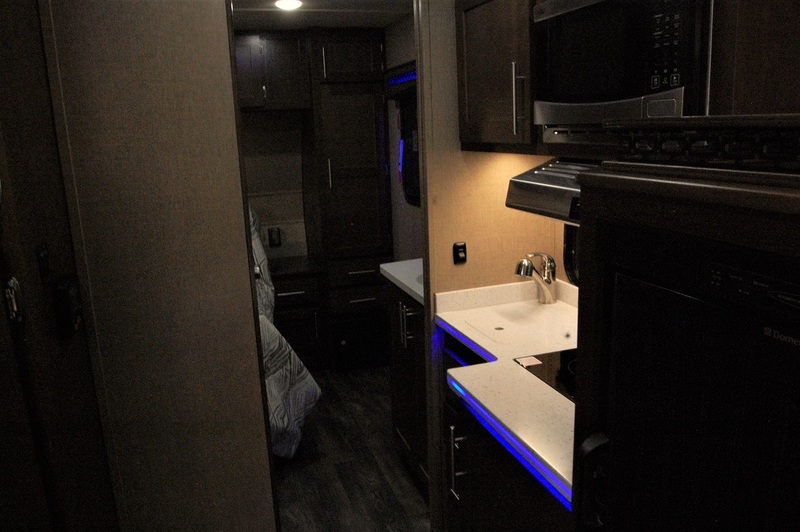 It’s a color you don’t see in many trailers and brightens things up while separating itself from the others. 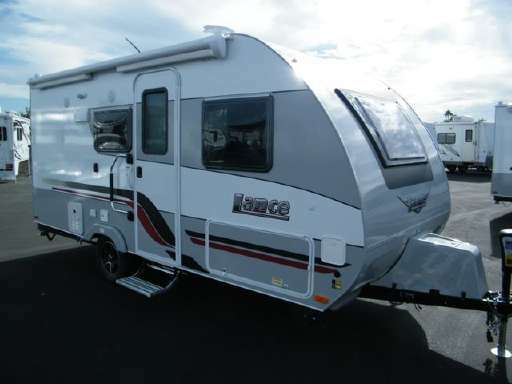 With Starcraft being a member of the Jayco family, it also offers a 2 year manufacturers warranty on the Comet Mini, which is something r-pod and the Winnie Drop do not. 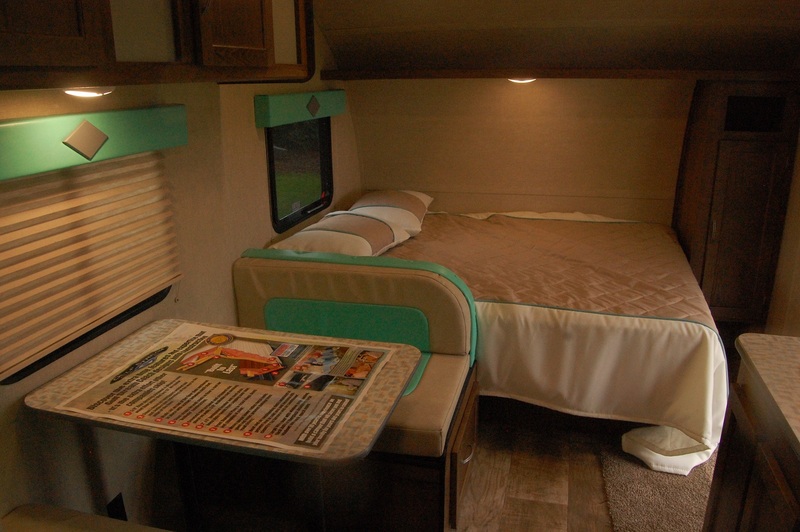 All in all, the Comet Mini appears to be a sound option for those of you in the market for the so-called European styled exterior design. 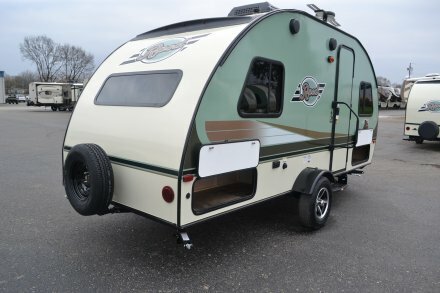 R-pod vs. Winnie Drop: Let the lawsuits begin! 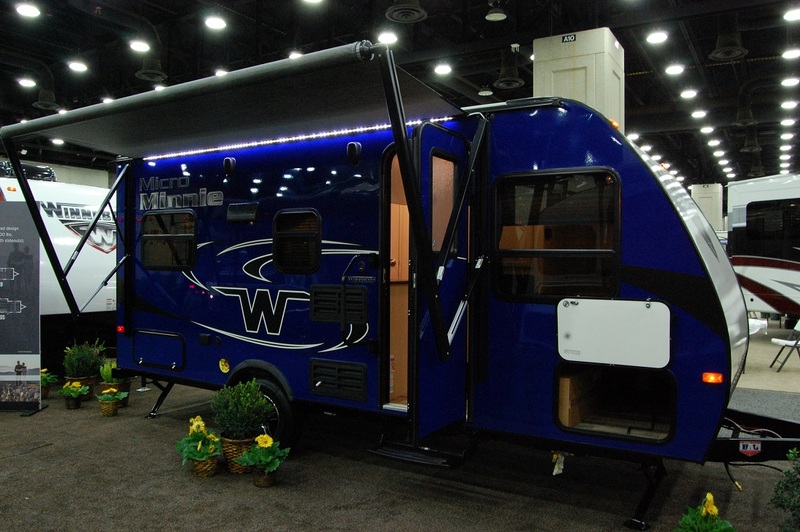 In our “who didn’t see this coming” category, Forest River has filed a lawsuit against Winnebago Industries. 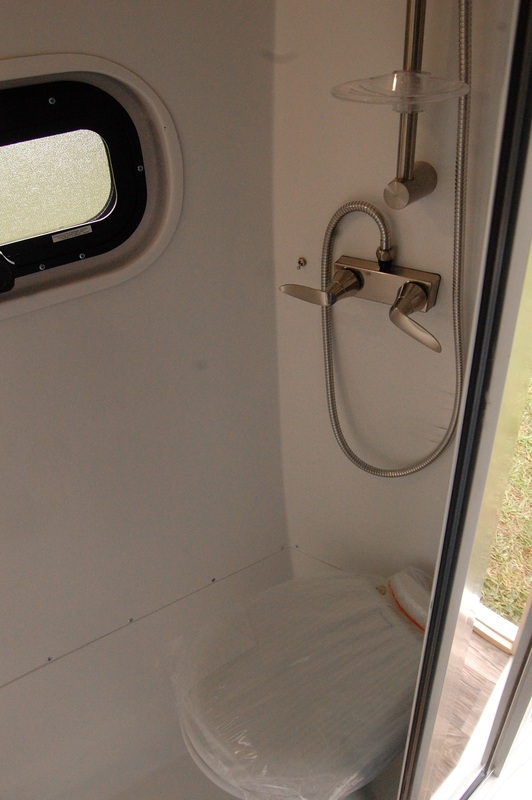 The suit stems from Winnebago’s recent introduction of the Winnie Drop, which strikes a resemblance to Forest River’s 7 year old R-pod. I’ll be watching this closely at it goes through the legal process. 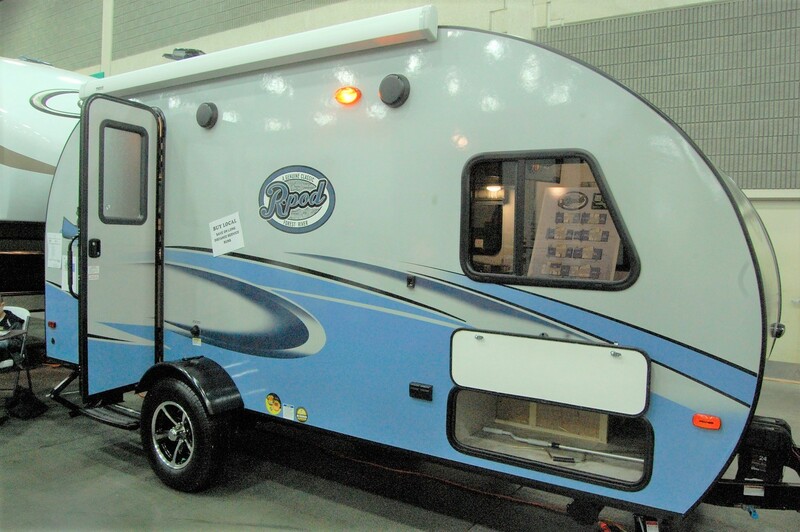 Forest River filed suit a few years ago for similar reasons against Heartland and their now defunct “mpg” trailer. 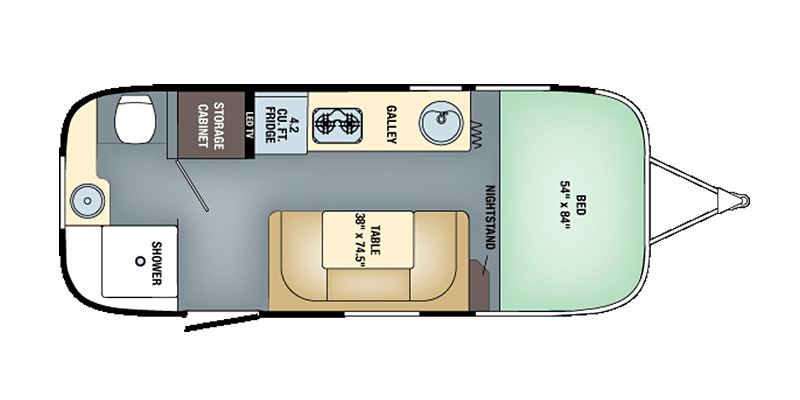 Industry professionals I’ve talked to shake their heads when talking about trademarking an RV floorplan. 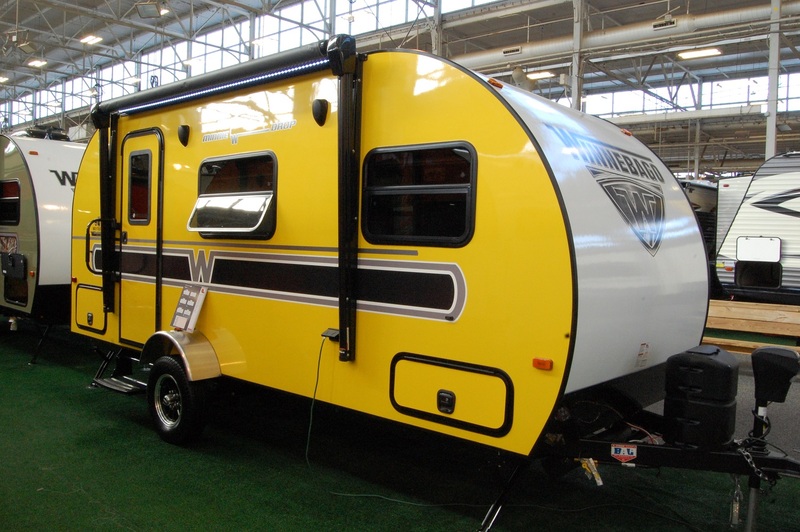 If anyone has ever gone to an RV show, you all know everything is copied by everyone. 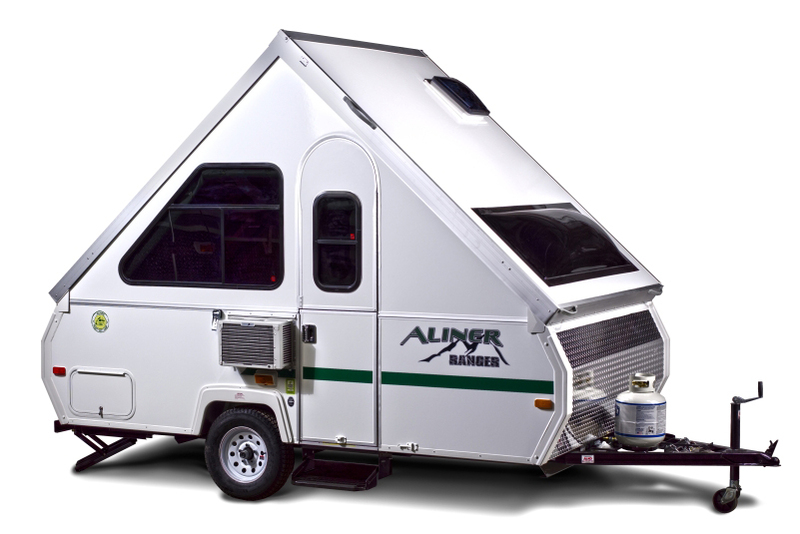 I’ll make no bones about it, I’m no legal expert and I don’t have a clue where this lawsuit will go, but should Forest River be successful I’d be interested to know if a company like A-Liner has similar patents on their hard-sided A frame campers. 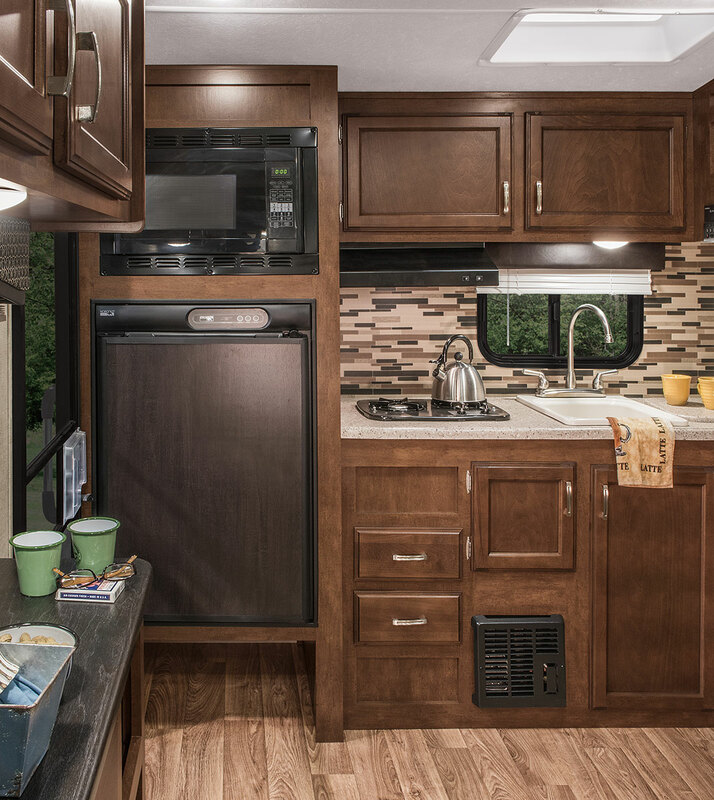 They’ve been around the longest, but other companies have developed their own version….including Forest River’s Flagstaff. 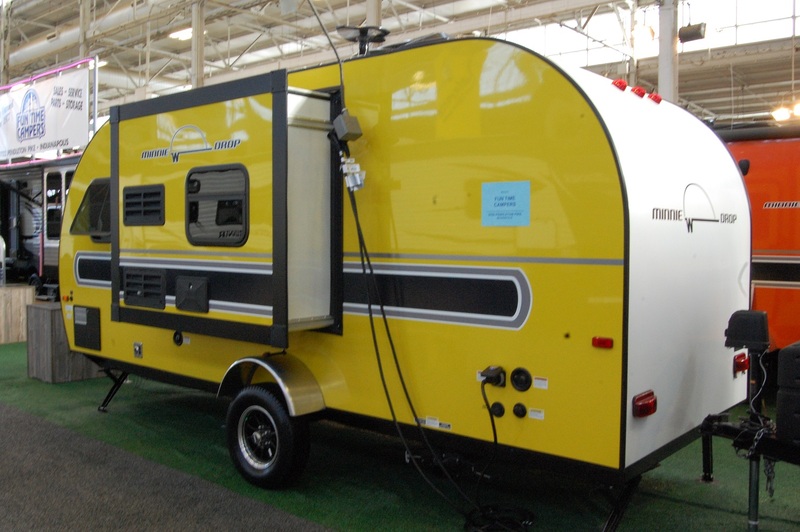 My final take on this or any similar lawsuits involving RV companies is that it really does nothing to serve the consumer. If anything it eliminates what makes a product better: Competition. 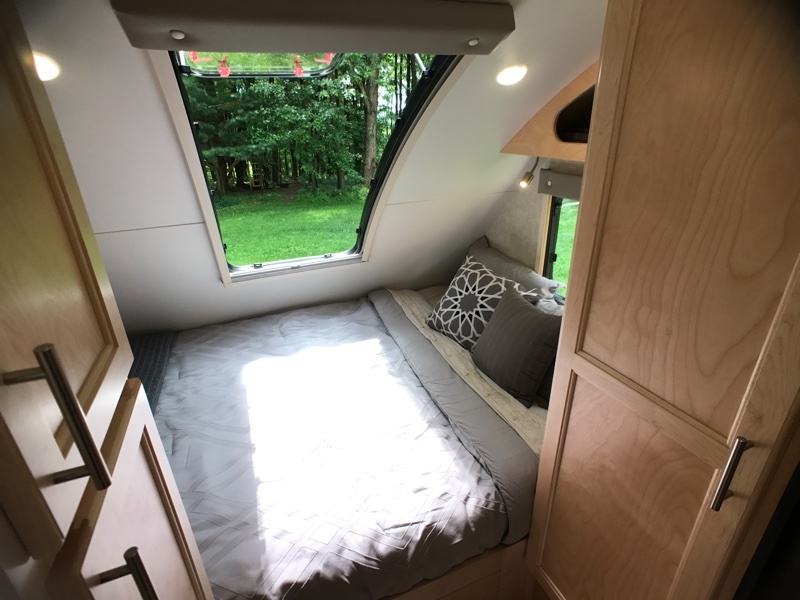 When you eliminate your competition because you have a legal machine like Forest River does, it eliminates the competition that forces you to come up with ideas that make your product better than the other guy. If there is no “other guy”, then your product gets stagnant, and quality and innovation exit the building. I’ll update this story with future posts as additional news develops. 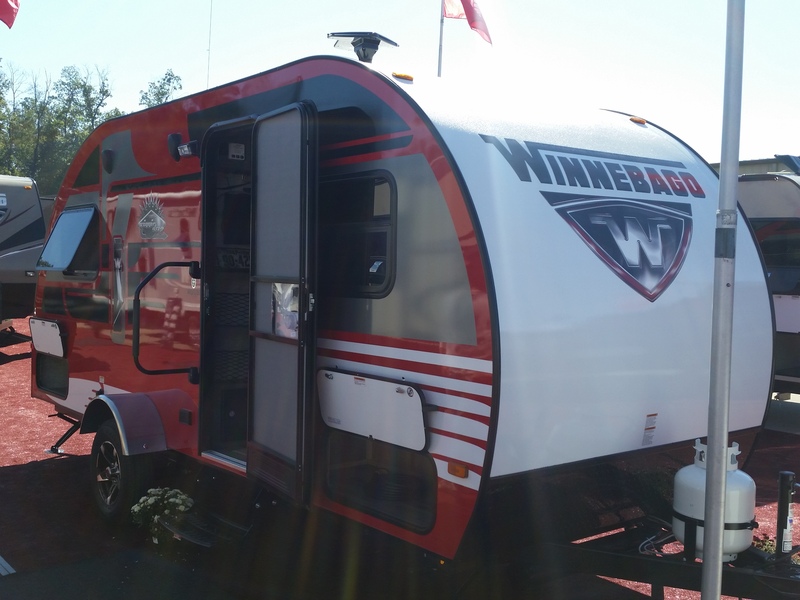 One of the new trailers unveiled at last week’s dealer RV Open House in Elkhart, Indiana was the Winnebago Winnie Drop, as I first told you about on September 24 in this post. 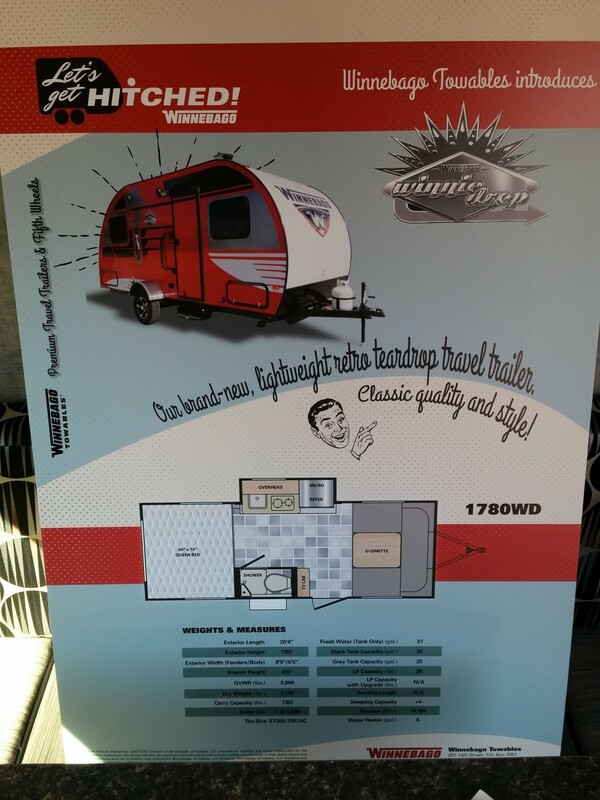 I received a batch of photos of the prototype from Winnebago towables dealer Austin Braun of Braun’s Fun Time Campers in Indianapolis. 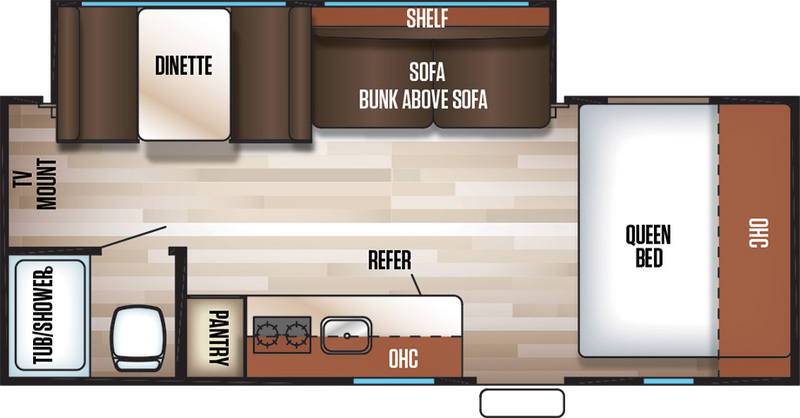 The initial floorplan, the 1780WD, will have an exterior length totaling 20’4″, a generous 6’5″ interior height, a rear 60″ x 74″ queen bed, a large front U-shaped dinette, a slide out for the kitchen, a wet bath, a dry weight of 2780 lbs, a GVWR of 3800 lbs, a 31 gallon fresh water tank, and a 25 gallon black water tank and gray water tank, as well as the usual 6 gallon water heater, all while sitting on a 3500 lbs single axle. The Winnie Drop should be available sometime early in 2016 and although an MSRP is not officially been set, Austin tells me it should be somewhere in the upper teens. I’ll provide updates as new details become available. 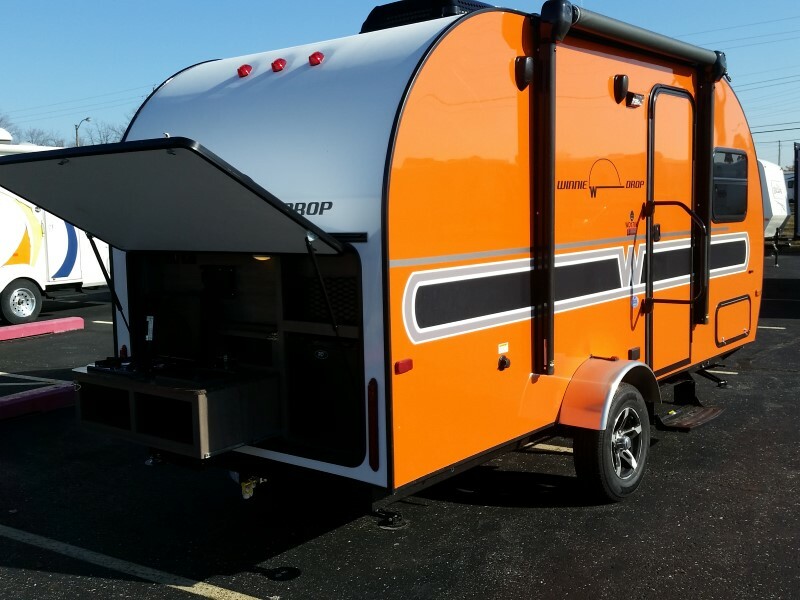 This week at the RV Open House in Elkhart, Indiana, Winnebago Industries has debuted a new small, lightweight trailer called the Winnie Drop. 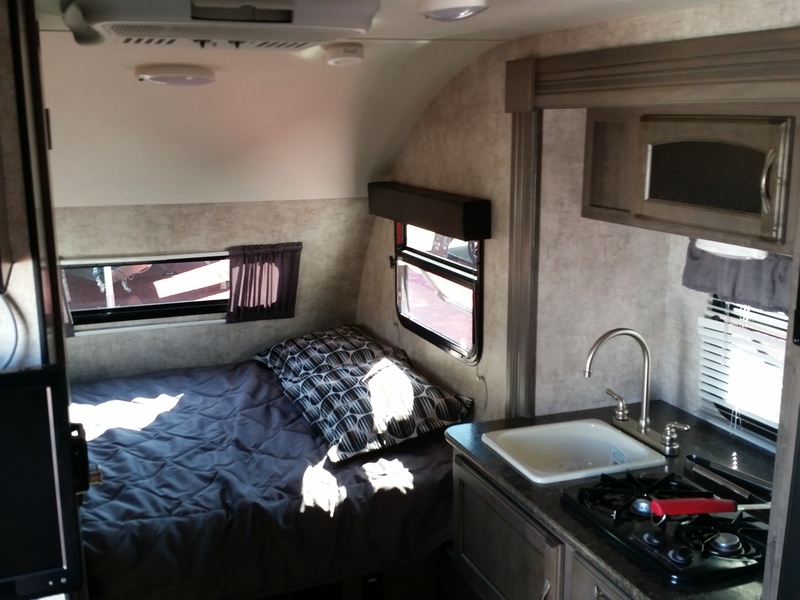 Details are thin at this point, but I should be able to get some more info and pics soon. 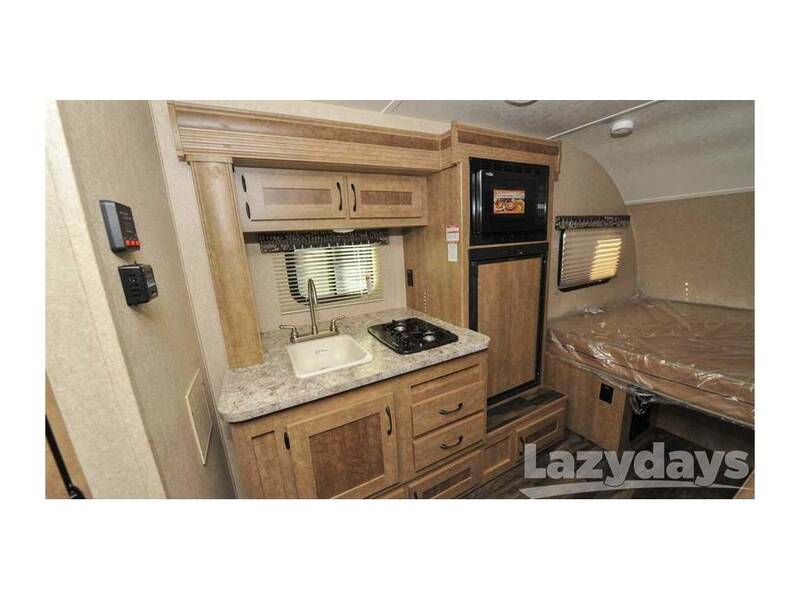 This photo was released by RV Business last week of the new trailer to the Winnebago towable lineup. 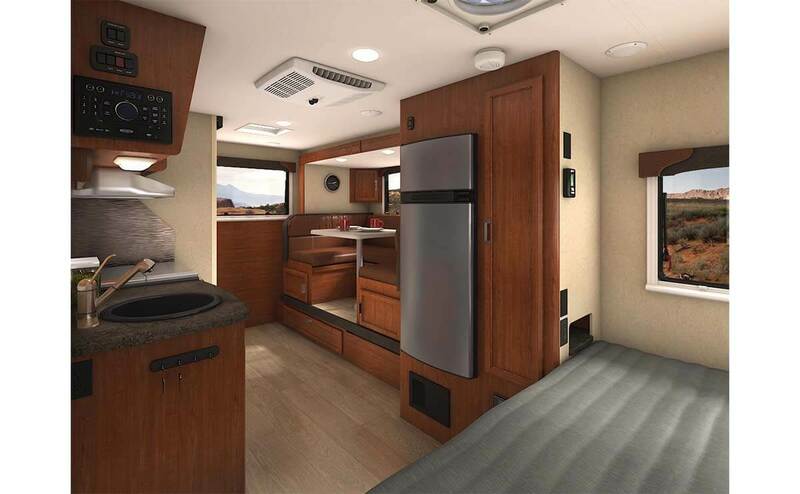 However, what we do know about the Winnie Drop is that it’ll will be available in five exterior colors in four floorplans, including one with a rear hatch featuring an outside kitchen and an expandable hybrid tent model. 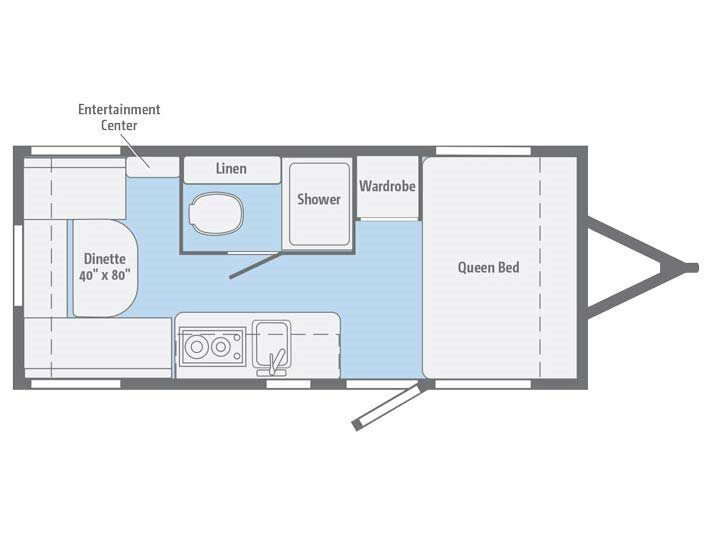 If the look of the Minnie Drop and these floorplan descriptions sound familiar, that’s no accident. 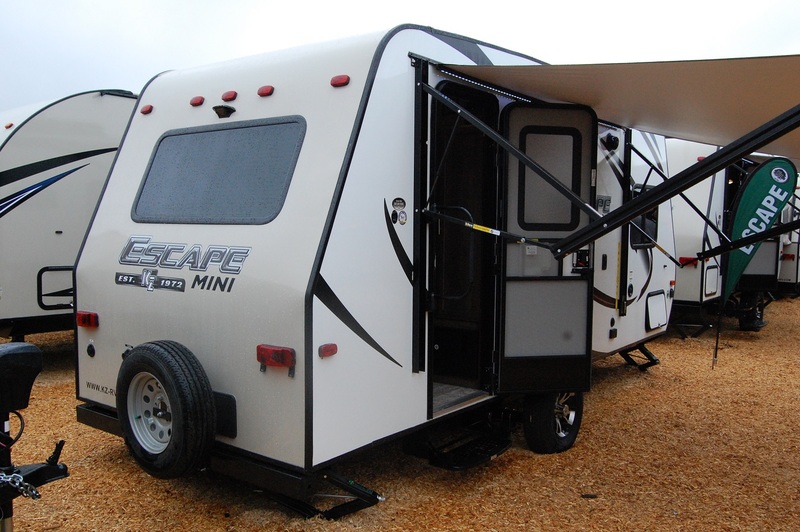 The Winnie Drop is quite obviously built as a competitor to Forest River’s popular r-pod. 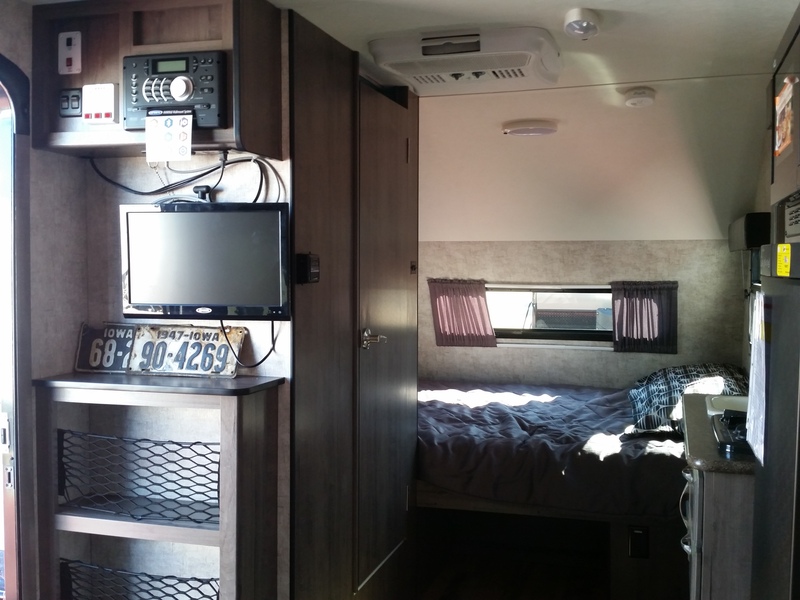 I should be getting some additional info and pictures soon, so I’ll post an update as soon as that happens.